The Respiratory System supplies oxygen and removes waste carbon dioxide from the body through a combination of ventilation and gas exchange across the blood-gas barrier (pulmonary capillary-alveoli interface). The Respiratory System is designed to model the ventilatory behavior (both positive- and negative-pressure) of the patient Respiratory System using electrical analogue lumped parameter models. The Respiratory Model employs realistic pressure source signal and chemical stimuli feedback mechanisms as drivers for spontaneous ventilation. The model handles several patient conditions, including tension pneumothorax and airway obstruction. The majority of the lung values investigated for the overall model matched the validation data found in publications. Patient conditions also showed strong agreement with clinically significant output parameters, i.e., respiration rate, oxygen saturation, heart rate, and blood pressure. The human Respiratory System consists of the upper airways (region above the cricoid cartilage), the lower airways, the lungs, and the respiratory muscles. The lower airways begin at the trachea and extend to the bronchi, bronchioles, and the alveoli. At the carina, the trachea divides into two mainstem bronchi, the right and left. The bronchi bifurcate into smaller bronchioles that continue branching for up to 23 generations, forming the tracheobronchial tree that terminates with the alveoli. Alveolar ducts and alveolar sacs are the operating units of the lungs where gas exchange occurs with the pulmonary capillaries. The first several generations of airways, where no gas exchange occurs, constitute the anatomic dead space and are referred to as the conducting zone. In contrast, alveolar ducts and sacs that terminate the tracheobronchial tree are referred to as the respiration zone. The alveolar-capillary gas exchange is facilitated by the ventilation process, which is driven by the intercostal muscles, the diaphragm, and the chest wall recoil. These mechanisms work in tandem to actively drive fresh air into the lungs and passively remove gases from the lungs. Attached to the chest wall is a thin layer of membrane (pleura) that folds back onto itself, forming two layers, known as the visceral and parietal pleurals. The pleural cavity is filled with fluid. The pressure in this space, known as the intrapleural pressure, is normally slightly below the atmospheric pressure. Even when no inspiratory muscles are contracting, the mechanical interaction between the lung and the chest wall pulls the two pleural membranes apart, resulting in a slightly decreased intrapleural pressure (-3 cm H2O to -5 cm H2O)  . Mathematical modeling of the respiratory physiology dates back to the work published by Gray in 1945  . Gray provided the first mathematical description for the chemical control of pulmonary ventilation. Later, Gordins et al. developed the first dynamic model of the respiratory system in 1954  . Several mathematical models followed after that, including the work by Guyton and collaborators in 1965  and others (  ,  ,  ,  ). Many of the published models describe a specific aspect of the respiratory physiology in considerable detail. To name a few, Lorandi et al. employed a mathematical model to describe the mechanical properties of the lungs, Murray et al. described the gas exchange properties of the lungs, Wiberg et al. and Bache et al. described the effect of higher levels of CO2 or anesthetic gases on breathing, and Whipp et al. developed a mathematical model to describe the respiratory anaerobiosis in skeletal muscle. Many mathematical models of mechanical ventilation employ the lumped parameter model that represents the entire ventilation process with a small number of unknowns. 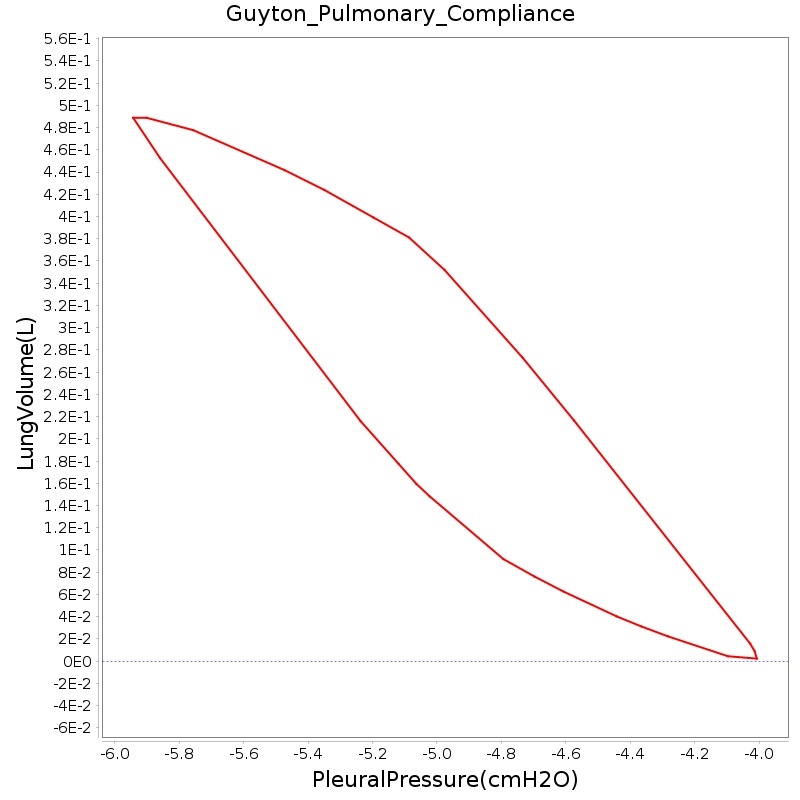 The simplest lumped parameter model of mechanical ventilation assumes the conducting zone can be identified with a pipe that connects a collection of alveoli to the atmosphere and exerts pneumatic resistance to the flow. 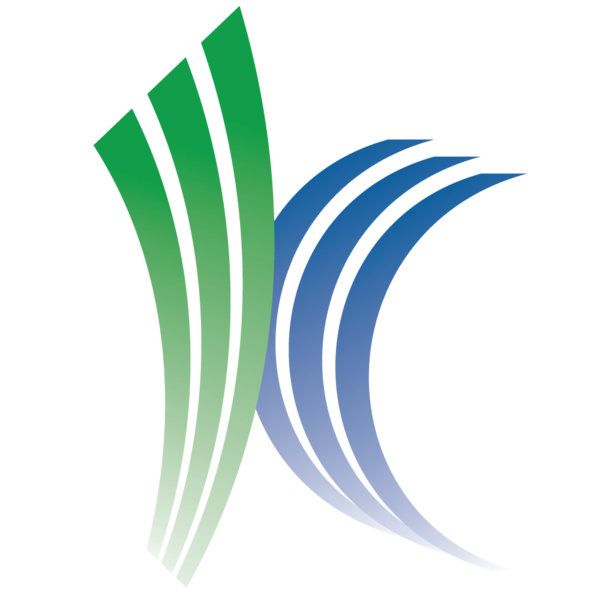 This type of model can be solved with a low computational cost, which reduces runtime. For whole body models/simulations, this is an important requirement. The disadvantage of lumped parameter models can lie in the large number of parameters that can result from required circuit parameters. It is important to identify the key features and behaviors of any model to intelligently reduce the number of required parameters. a relation analogous to Ohm's law can be derived. The Respiratory Model has its roots in the mathematical model of Yashuri Fukui and N. Ty Smith  . The researchers developed a lumped parameter mathematical model to describe the uptake and distribution of halothane. Their Respiratory Model consisted of two pulmonary compartments corresponding to the dead space and the alveoli . The Respiratory Model in the engine is an extension of the work by Fukui and Smith. This model was developed and released by Advanced Simulation Corporation as part of the simulator, Body Simulation for Anesthesia™. This later formed the backbone of the HumanSim™ physiology engine, which continues to provide realistic physiology for several serious training games in the HumanSim product line, including HumanSim: Combat Medic and HumanSim: Sedation and Airway  . The HumanSim physiology engine is the starting point for the engine. The basic elements of the Respiratory System remain the same as the HumanSim physiology engine; however, the respiratory circuit has been further developed to allow realistic mechanical responses to pathological conditions. The current version of the Respiratory Model represents the two lungs and associated airways as five major functional units, or compartments, that are designated as the carina, right and left anatomic dead space, and right and left alveoli. In the model, the carina compartment represents the anatomical region from the airway at the trachea. The right and left anatomic dead space compartments represent the bronchi and their branching bronchioles that are part of the conducting airways below the carina. The right and left alveoli compartments correspond to the collection of alveoli where gas exchange occurs between the airways and the Cardiovascular System. The right and left chest wall compartments represent the right and left sides of the thoracic wall. The new model additionally accounts for the pleural cavity through circuit elements that allow flow into the pleural space in the event of respiratory insults that involve gas leak either from the alveoli or the thoracic wall. To account for flow through the esophagus, an incidence that may occur during mechanical ventilation (positive-pressure ventilation), the model provides subordinate compartments representing the esophageal passage and the stomach. The model also consists of a pressure signal generator representing the respiratory muscle pressure source driver. The Respiratory System determines its state at every time step through a three step process: Preprocess, Process, and Postprocess. In general, Preprocess determines the circuit element values based on feedback mechanisms and engine settings/actions. Process uses the generic circuit calculator to compute the entire state of the circuit and fill in all pertinent values. Postprocess is used to advance time. 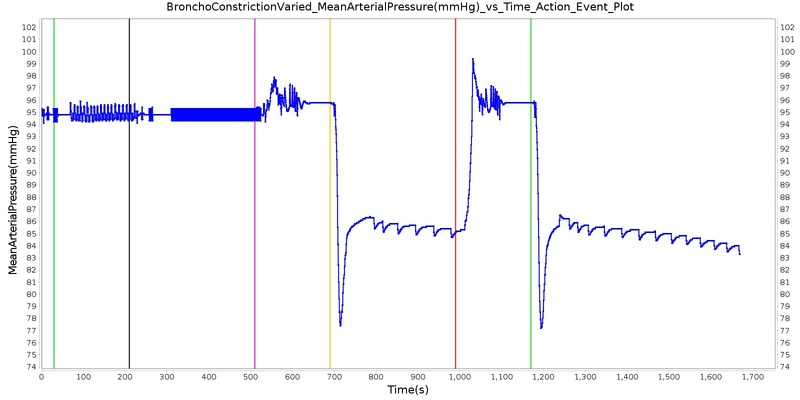 At the beginning of a simulation, patient parameters are used to modify the muscle (pressure source) driver functionality to achieve the specified values at the end of the resting stabilization period - see the Patient Variability section for more details. After resting stabilization is achieved, any user-selected conditions are implemented to reach a new homeostatic point - see the Conditions section for more details. The compliances of the left and right pleural space are modified as a function of volume. Process Actions deals with modification of the respiratory parameters and circuit properties due to actions (insults or interventions) specified by the user. The respiratory muscle pressure source that drives spontaneous ventilation is calculated based on chemical stimuli feedback control mechanism. The generic circuit methodology developed for the engine is used to solve for the pressure, flow, and volume at each node or path. For more details on this, see the Circuit Methodology. Substance volumes and volume fractions (concentrations) are also calculated during this step. See the Substance Transport Methodology for more details. The Calculate Vital Signs function uses the circuit pressure, flow, and volume to calculate important system-level quantities for the current time step. The Postprocess step moves values calculated in the Process step from the next time step calculation to the current time step calculation. This allows all other systems access to the information when completing their Preprocess analysis during the next time step. Assessments are called outside of the system to allow compiling of information from multiple systems. Figure 2. The data flow for the Respiratory System consists of Preprocess, Process, and Postprocess. Preprocess sets the circuit element values based on feedback mechanisms and engine actions. Process utilizes generic circuit methodology to solve the respiratory circuit for pressures, volumes, and flows along paths and on nodes. Process also updates system level quantities by calculating the vital signs. Postprocess updates these quantities to the next time step and then begins advancing time. The Respiratory System designates a set of functional elements, or compartments, to model mechanical ventilation. The functional elements are represented by an electric analogue circuit comprised of resistors, capacitors, switches, diodes, and power sources. The latter represents the driving pressure from the respiratory muscles. The resistors and capacitors represent the resistance to flow through the airways and the elastic nature of the airways, alveoli, and thoracic walls. The equivalent of an electric switch is used to transition between different ventilation conditions or flow pathways. For example, the electric analogue switch accounts for incidents that permit flow through the esophageal tract while prohibiting flow through the trachea. Unidirectional flow in the respiratory system is handled through electric analogue diodes that allow flow in one direction, preventing flow in the opposite direction. Such functional elements are employed to represent insults that allow unidirectional gas flow into the pleural cavity through an opening at the alveoli or the thoracic wall. Figure 3. Circuit diagram of the Respiratory System. The diagram depicts a closed circuit of the seven major compartments (trachea, right and left anatomic dead space, right and left alveoli, and right and left chest wall) and the four subordinate compartments (right and left pleural, esophagus, and stomach). Each of the alveoli and anatomic dead space compartments are represented by a combination of resistor and capacitor. The remaining compartments are represented by resistors or capacitors. The circuit also depicts the muscle pressure source that serves as the driver for the Respiratory System. Unless changed for insults and interventions, the subordinate compartments have "infinitely" large resistors and behave as open electrical switches. In the circuit model, the carina and right and left anatomic dead spaces are represented by resistors to account for pneumatic resistance that impedes flow of gas across the conducting zones. A capacitor representing the compliance of a compartment is added to the nodes designated as anatomic dead spaces to account for the elastic behavior of the lower airways. Each of the right and left alveoli compartments are represented by a combination of resistors and capacitors (compliances) to account for the elastic behavior of the alveoli. The right and left chest wall compartments are represented by variable compliance that allows flexibility to mechanical insults. Based on the electrical circuit analogue, the model predicts the dynamic properties of the Respiratory System. Figure 3 depicts the network of respiratory circuit elements and their interconnections. The respiratory circuit employs circuit nodes and paths to represent physiological state variables belonging to the Respiratory System's functional units. In this representation, the pressures across the compartmental units are designated to the nodes, while all other variables (flow, volume, hydraulic resistances, and compliances) are assigned to the paths on the circuit. At any instant of time, the flow Q on a path across a resistor R can be calculated using the pressure difference ΔP between the nodes across the path as Q=ΔP/R. Similarly, the volume change ΔV of a respiratory element with compliance C can be calculated based on the pressure difference ΔP between the nodes connected by the path as ΔV=CΔP. The time evolution of the pressures at each node in the circuit is solved using the Circuit Solver as described in the Circuit Methodology. The Pulmonary Function Test also pulls all lung volumes and capacities, and conscious respiration uses several of the initial capacity values to calculate the driver pressure needed. The patient Alveoli Surface Area is also modified when COPD and lobar pneumonia effects are applied. The Respiratory System interacts with other systems in the engine to receive feedback and adjust spontaneous breathing for homeostasis. To accurately model the respiratory response under various physiological and pathological conditions, a robust Respiratory Model that responds to mechanical stresses and chemical stimuli is required. To this end, the engine Respiratory System employs a time-dependent pressure source based on a chemical feedback mechanism that mimics the respiratory response to blood gas levels as sensed by the central and peripheral chemoreceptors. The pressure source represents the muscle pressure source signal and serves as an input power source to drive the inspiration and expiration phases of the breathing cycle. During inhalation, the driver pressure source is set to a negative value. The end of the exhalation cycle represents the initial conditions of free breathing, where the alveolar pressure equals the atmospheric pressure and no air flows into the lungs. When the inspiratory muscles are not contracting, the mechanical interaction between the lungs and the chest wall creates a subatmospheric intrapleural pressure. The value of the driver pressure in the model is selected to meet the unstressed condition at the pleural node. In the case of mechanical ventilation, the anesthesia machine controls the pressure at the airway node for positive pressure ventilation. More details on positive pressure ventilation can be found in the Anesthesia Machine Methodology. 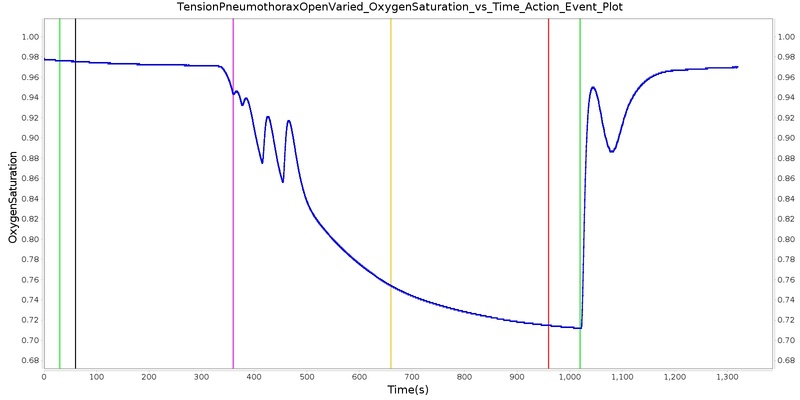 Where TI and Ttot are the inspiratory and total respiration times, respectively. fv=1/Ttot is the ventilation frequency, P0.1 is the mouth occlusion pressure, and Pmax is the maximum muscle pressure that specifies the amplitude of the pressure source signal. 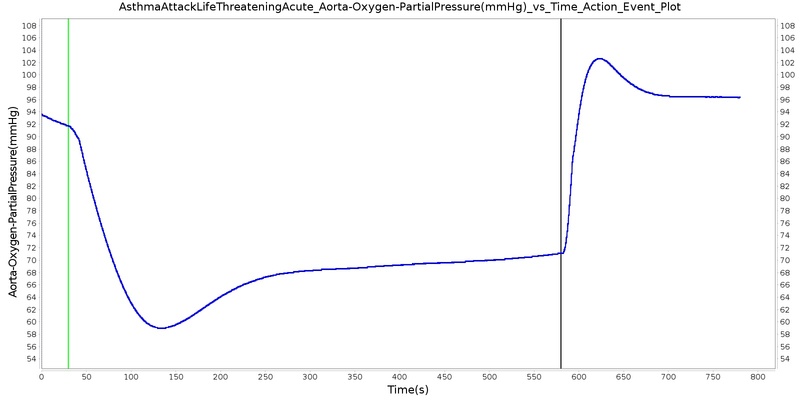 Pmax is estimated using a pressure/volume curve constructed from simulation data. 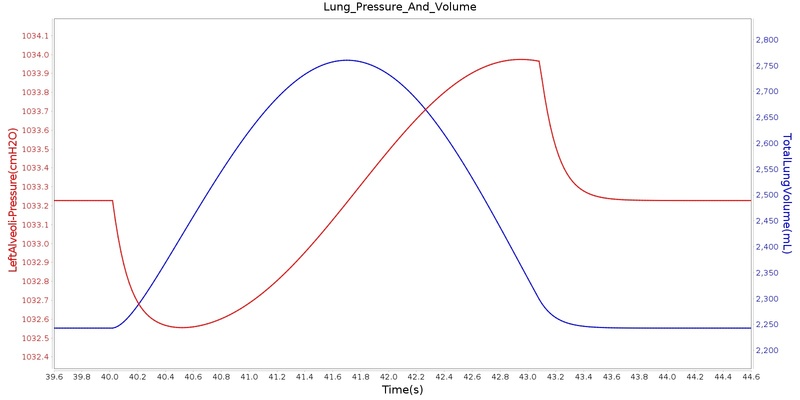 The Respiratory System circuit was exercised over a range of pressures to produce a curve showing lung volume as a function of driver pressure (Figure 4). Given the desired lung volume (based on target tidal volume, see Equation 13), Pmax can be estimated. Figure 4. Maximum driver pressure, Pmax, as a function of lung volume. V.D is the dead space ventilation and is obtained by taking the product of the dead space volume and the respiration rate. 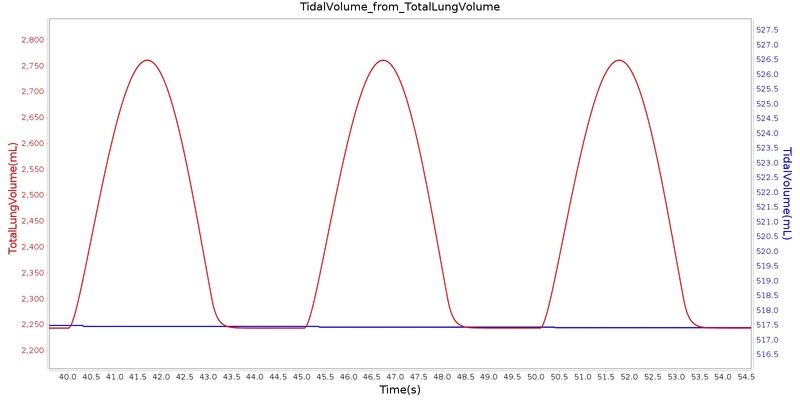 The target tidal volume VT needed to predict fv using Equation 10 is calculated from the pulmonary ventilation based on a piecewise linear relationship between the tidal volume and the minute ventilation as shown by Watson  . In the article, the author presented data that describes the relationship between the minute ventilation and tidal volume by straight line. The data is reproduced in Figure 5 below. Figure 5. The figure shows data from literature that presents the linear relationship between the minute ventilation and tidal volume. The relationship was derived from a line fit of experimental data with a wide range of varying carbon dioxide, exercise, postures, alveolar gas tensions, adrenaline, mild acidaemia, alkalosis, morphine, mederidine, mild hypoxia, and breathing through a small fixed resistance. All test cases matched this trend of two intersecting straight lines. The figure is reproduced from  . 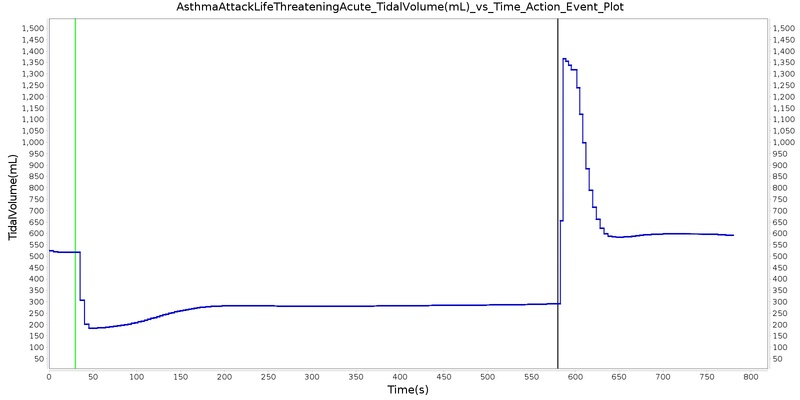 where m is the slope and c is the x-intercept of the minute ventilation versus tidal volume plot. The data shows that the minute ventilation is constant above half of the vital capacity. Based on this observation, the %Respiratory Model employs the linear relation given below to predict the target tidal volume from the minute ventilation. Where m and c are constant parameters determined during initialization. 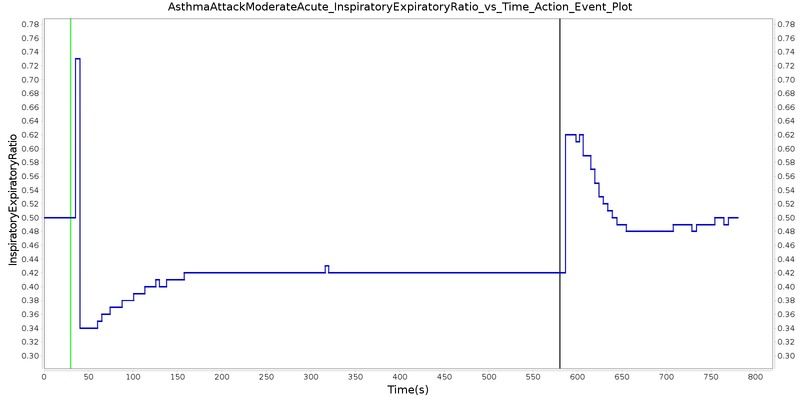 During the initial parameterization, the minute ventilation is plotted against the vital capacity to determine c by taking the x-intercept of V.E vs VT plot. Then, the slope is adjusted to meet the initial baseline parameters of the patient. These parameters include the baseline respiration rate and tidal volume, where the latter is estimated from the patient's weight. Once m and c are selected this way, they are used as patient parameters for determining the target tidal volume from the minute ventilation that is determined by the feedback mechanism. This provides the target tidal volume that must be attained to respond to the chemical stimuli feedback. This value is then communicated back to the target ventilation frequency fv, which in turn adjusts the patient's breathing frequency through the muscle pressure given in Equation 6. The muscle pressure then drives sufficient gas into the lungs in response to the chemical stimuli, completing the feedback loop. In the calculation of the target tidal volume, the Respiratory Model allows the target tidal volume to increase linearly with the calculated minute ventilation as long as the target volume is below half the vital capacity. In the event that the calculated target volume is above half of the vital capacity, the target volume is set to a constant value of 0.5VC as shown in the above equation. In the model, the lung vital capacity VC is calculated from the patient's total lung capacity and residual volume as described in the sections below. The model described above is implemented in the engine with reference values and model parameters that are tuned to meet validation data. The reference and tuned values for the model parameters are shown in Table 1 below. Note that our model is tuned to use the reference values without modification. Table 1: Respiratory driver model parameters and reference values used in the chemical feedback mechanism implementations. 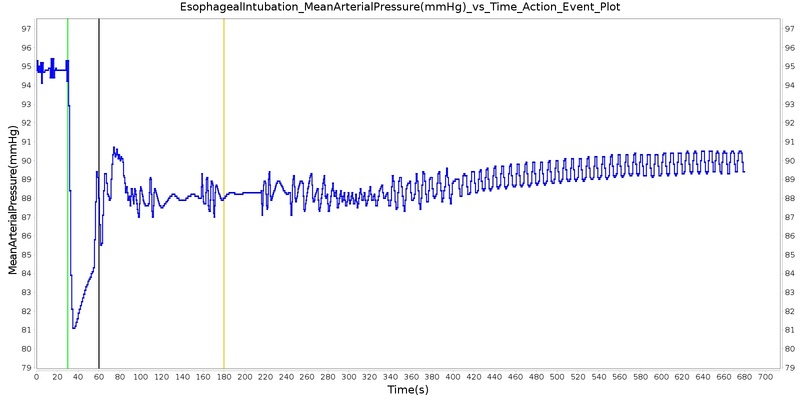 Figure 6 depicts the time-dependent driver pressure source of the Respiratory System as obtained during simulation of the standard patient model of the engine (77 kg adult male) under normal physiological conditions. 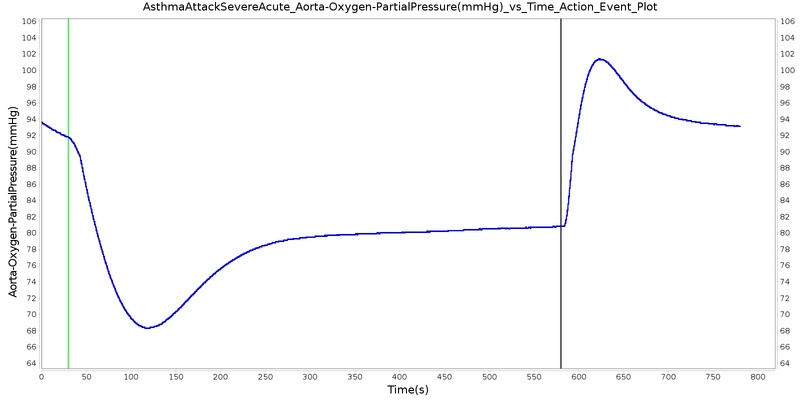 For comparison, the driver pressure is plotted with the alveolar, intrapleural, and transpulmonary pressures. The figure shows the pressures for several breathing cycles. As seen in Figure 6, the model driver pressure exhibits distinct waveforms during the inspiration and expiration phases. These patterns represent the active distension and passive relaxation behaviors of the inspiratory muscles. As a result of such input, the model distinguishes between the active inspiratory and passive expiratory phases of the breathing cycle. 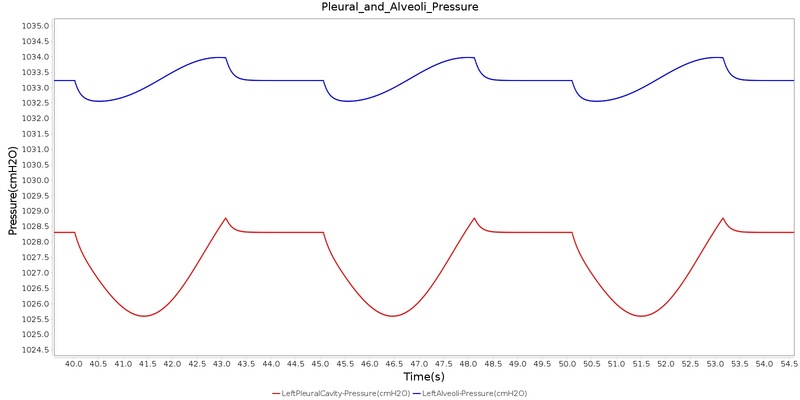 The time-dependent muscle pressure together with the atmospheric pressure and the compliances act in tandem to generate the pleural and alveolar pressure waveforms shown in the figure. Figure 6. The driver pressure, or pressure source, that serves as an electrical analogue voltage source for the respiratory circuit is plotted along with the alveolar, intrapleural, and transpulmonary pressures. The pressure source generates a subatmospheric intrapleural pressure that facilitates the inspiration and expiration phases of spontaneous breathing. There are a number of standard lung volumes and capacities that are measured during different stages of normal and deep breathing cycles. The inspiratory reserve volume (IRV), tidal volume (VT), expiratory reserve volume (ERV), and residual volume (RV) correspond to the four standard lung volumes. The inspiratory capacity (IC), forced residual capacity (FRC), vital capacity (VC), and total lung capacity (TLC) are the four standard lung capacities that consist of two or more standard lung volumes. These volumes and capacities are good diagnostics for lung functionality, and the Respiratory Model reports their values as outputs. As mentioned above, some of the parameters are obtained from patient data as input variables. The TLC and FRC are two of these parameters that are drawn from the patient data. For the standard patient in the model, TLC and FRC are set to be 6.0 L and 2.4 L, respectively. Using these parameters as inputs, the engine calculates the other standard lung volumes and capacities as described below. The residual volume is the volume of gas remaining in the lungs after maximal exhalation. As mentioned above, the Respiratory Model approximates the residual volume based on the patient weight (RV = 16.0 mL/kg) ( ,  ). For the standard patient in the model with 77 kg weight, the residual volume RV=1.23 L. Typical values of RV vary in the literature. For example, for 70 kg patients: RV=1.5 L  , 1.2 L , and 1.682 L  . The engine employs weight-based relation and the values used in the engine are close to those found in the literature  . In this equation, both FRC and RV are input values obtained from weight-based relation. For the standard patient in the model (77 kg adult male), FRC=2.31 L, and RV=1.23 L, thus ERV becomes ERV=1.08 L. Typically, reported values for ERV are around 1.1 L  .
Tidal volume corresponds to the volume of air inspired or expired in a single breathing cycle during normal quiet breathing. For a healthy 70 kg adult, the tidal volume is 540 ml per breath. The tidal volume can be calculated by numerically integrating the volumetric flow rate of inspired air flowing through the trachea. The Respiratory Model calculates the tidal volume by taking the difference between the maximum and minimum total lung volumes during each breathing cycle. Figure 7 depicts the typical lung volume waveform for multiple breathing cycles. The Respiratory Model outputs the value of VT for each breathing cycle. 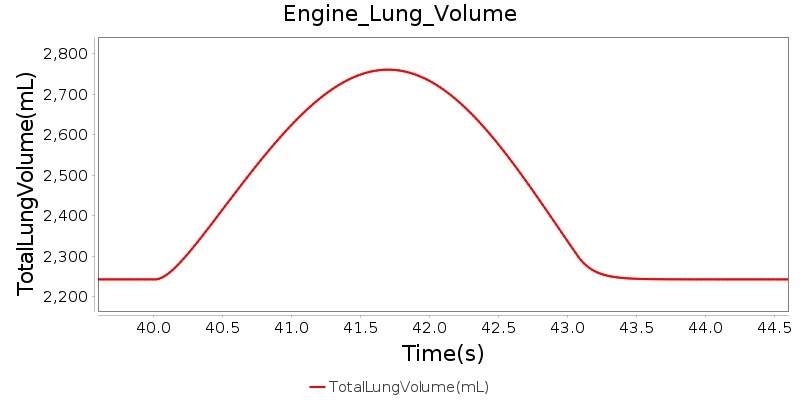 Figure 7 presents the plot of the total lung volume and VT as a function of time. Figure 7. 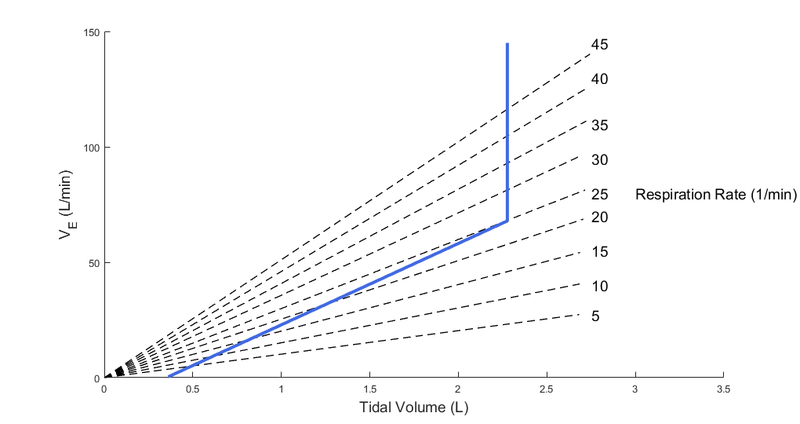 This shows the relationship of the total lung volume with the tidal volume. The tidal volume for each cycle is determined by taking the difference between the maximum and minimum values of the total lung volume, and is therefore only updated at the end of each full cycle. Both TLC and FRC are weight-based inputs to the model, whereas VT is calculated as described above. Using TLC=6.16 L (i.e., 80 mL/kg) and FRC=2.31 L (i.e., 30 mL/kg) of the standard patient in the model, IRV becomes 3.307 L for an average VT of 543 mL, where the average VT is calculated by taking the time average of VT described above. Using weight-based tidal volume of VT = 7 mL/kg  , IRV can be shown to be 3.31 L for 77 kg patient, in good agreement with the value from the model. Again, both TLC and RV are weight-based inputs to the model, and VT is calculated as described above. For the standard patient in the model with TLC=6.16 L (80 L/kg) and RV=1.23 L, VC=4.93 L. Typical values of VC reported in the literature are around 4.6 L  . The value in the engine corresponds to a weight-based vital capacity. In the model, both TLC and FRC are weight-based input variables, and IC can be calculated using the above equation. From the values in the model, IC can be determined to be 3.85 L.
As described above, the Respiratory Model employs chemical feedback mechanisms to regulate the ventilation frequency that affects the breathing cycle through the respiratory driver. The breathing frequency is adjusted in accordance to the arterial O2 and CO2 levels and other modifiers, such as drug and metabolic effects. The engine switches between the inspiratory and expiratory phases based on the predicted ventilation frequency. The respiration rate is then calculated by measuring the time taken for a complete breathing cycle and converting it to the number of breaths per minute. Typically, the respiration rate of a healthy adult is 16 breaths/min  . A similar value is obtained for the standard patient under normal tidal breathing. 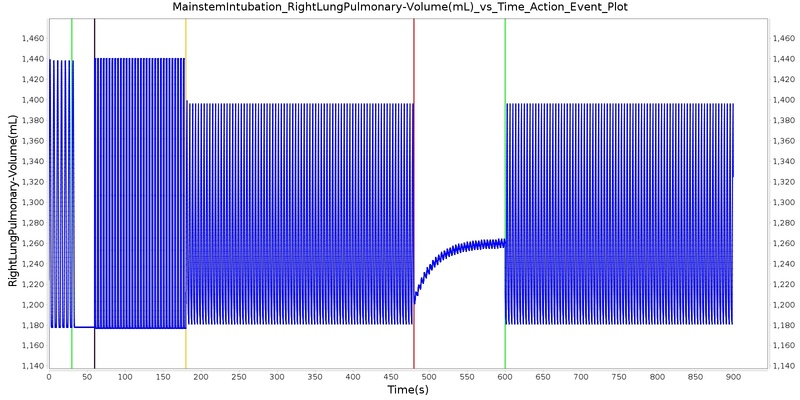 The Respiratory Model calculates both VT and RR from the simulation data. V.E can thus be determined from the above equation by using the average values of VT and RR. For the standard patient in the model, under normal physiological conditions, the average values of VT and RR are 0.540 L and 16 breaths/min, respectively. The total pulmonary ventilation obtained from the model equals 6.53 L/min. Typical weight-based value of minute volume is 84 mL/min/kg  . Using the mass of the standard patient (77 kg), the expected value of V.E is 6.48 L/min, which is close to the value found from the engine. The term alveolar ventilation corresponds to the volume of air entering and leaving the alveoli per minute  . The alveolar ventilation is calculated as V.A=(VT-VD)*RR where V.A is the alveolar ventilation in liters per minute and VD is the volume of the conducting airways that is referred to as the anatomical dead space. This is the region of respiratory tract where no gas exchange takes place. 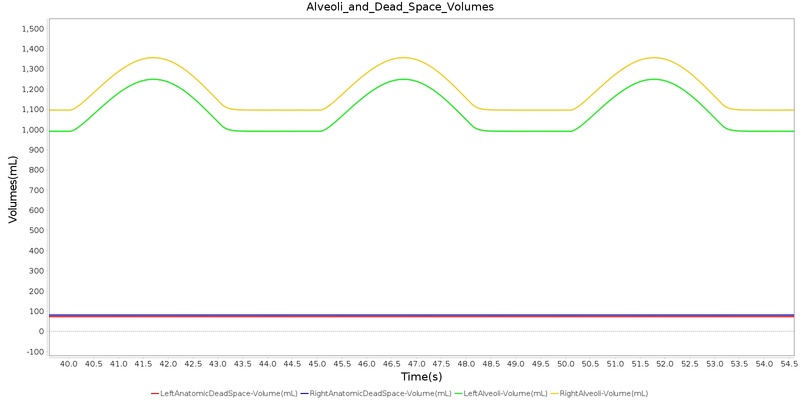 In the Respiratory Model, the volume of the dead space is calculated from the values assigned to the right and left anatomic dead space nodes. These nodes have continuously changing volumes due the compliances that are connected to the nodes. The right and left anatomic dead space volumes when compared to the right and left alveoli volumes are shown in Figure 8. When the patient weight is factored into the calculation, the alveolar ventilation predicted from the model is close to the expected value. Figure 8. The right and left anatomic dead space volumes together with the right and left alveoli volumes. The difference in the alveoli volumes is due to the difference in the lung ratio of the right and left lungs. The right and left lung ratios of the standard patient in the Respiratory Model are 0.525 and 0.475, respectively. The left and right dead space volumes are equivalent. Pmouth and Pcarina are the pressures at the mouth and the carina nodes, respectively (see circuit diagram, Figure 3). 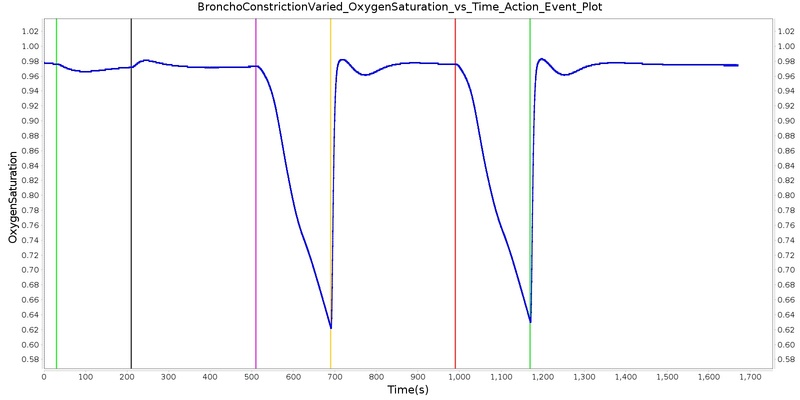 The figure shown below presents the absolute flow rate (no distinction for flow direction) for one breathing cycle. Figure 9. 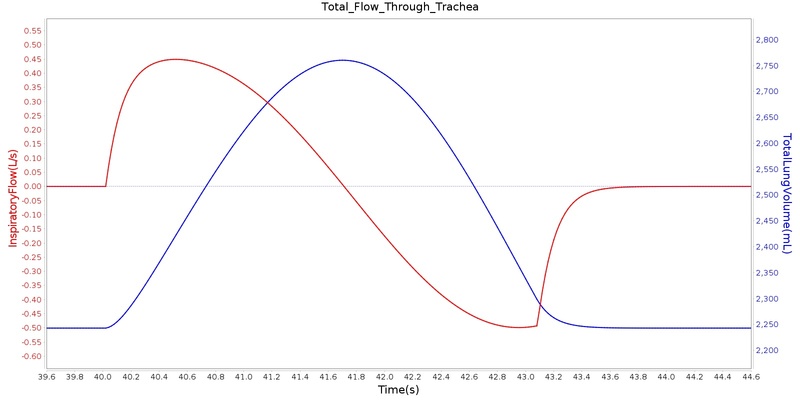 Tracheal airflow and total lung volume during one typical breathing cycle. At the peak of the inspiration phase, the flow rate goes to zero. The instantaneous pressures at the nodes of the respiratory circuit are calculated by solving the circuit matrix equation as described in the Circuit Methodology. The pressures at the right and left alveoli nodes of the Respiratory Model represent the alveolar pressure. 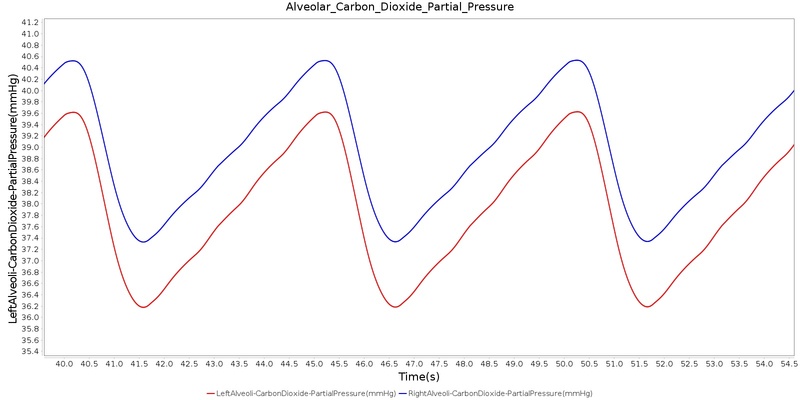 Typically, the values of the alveolar pressure vary in the range from -1.8 cm H2O to 1.8 cm H2O (relative to atmospheric pressure) during the inspiration and expiration phases of the breathing cycle  . The figure below depicts the alveolar pressure along with lung volume for one breathing cycle. The alveolar pressure in the engine is absolute (not relative to atmospheric pressure), so the relative pressure can be determined by subtracting the standard atmospheric pressure of 1033 cmH2O - giving outputs close to the range of -1.8 cm H2O to 1.8 cm H2O found in the literature  . Figure 10. Typical lung pressures. 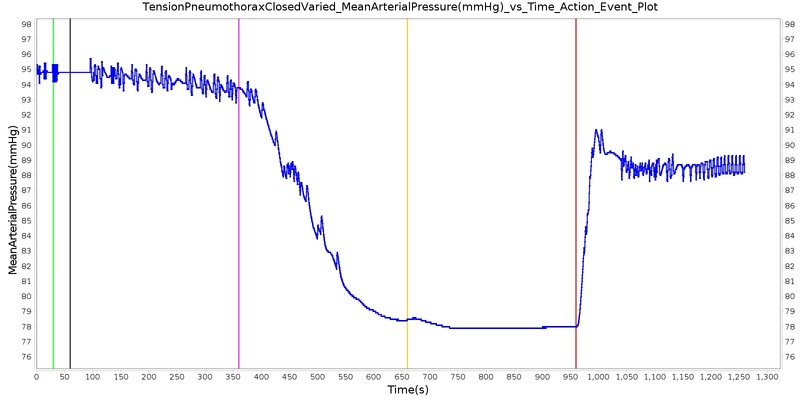 The plot shows the instantaneous pressure of the left alveoli for one breathing cycle. 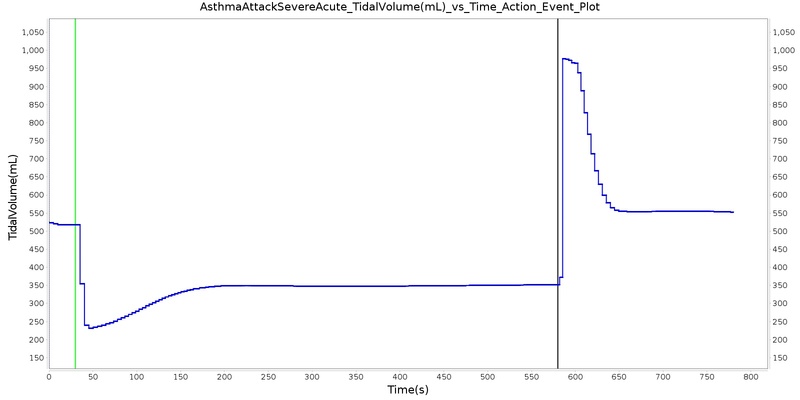 For comparison, the plot also shows the total lung volume for the same breathing cycle. As seen in this figure, the lung volume increases as the alveolar pressure falls below the atmospheric pressure of 1033 cm H2O. This creates a pressure differential between the airway node and the alveoli, allowing air to flow into the lungs. When the alveolar pressure goes above 1033 cm H2O, the lung volume decreases from its peak, representing the expiration phase. Transpulmonary pressure is defined as the difference between the alveolar and the intrapleural pressures. The Respiratory System derives the transpulmonary pressure from the calculated values of the alveolar pressure and intrapleural pressures. The alveolar pressure is obtained by taking the average of the left and right alveolar pressures. Similarly, the total intrapleural pressure is obtained by taking the average of the the left and right pleural pressures. The plots shown below compare the transpulmonary pressure from the engine with that found in literature . 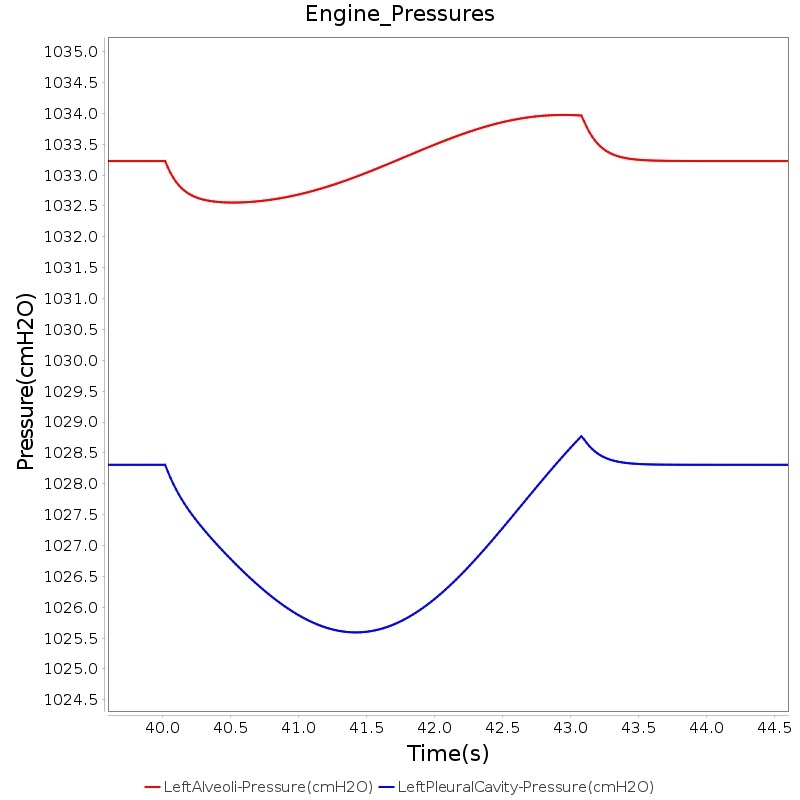 Some variations in the waveforms and possibly the average values is a consequence of the specific driver pressure and patient parameters employed in the engine. Figure 11. A plot showing the transpulmonary pressure obtained from the engine with that found and digitized from literature . The left plots use absolute pressure, while the right Guyton plots use the pressure difference from ambient (1033 cmH2O). 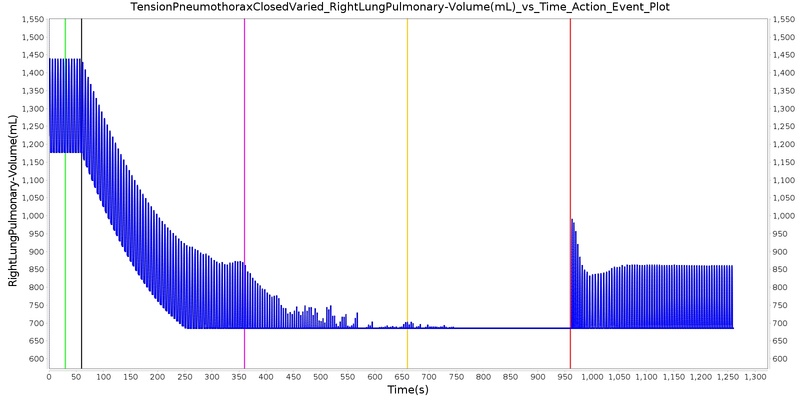 For comparison, the plot also shows the lung volumes from the two sources. One method of characterizing the lungs' elastic behavior is to use a diagram that relates the lung volume changes to changes in pleural pressure. The pressure-volume curve of a healthy person shows hysteresis during the inspiratory and expiratory phases. Figure 12 presents the pressure-volume diagram of data extracted from the Respiratory Model. For comparison, the plot also shows a P-V diagram reproduced from literature  . The figures show the plot of lung volume changes versus pleural pressure for one breathing cycle. The pleural pressure from the model is the average of the right and left pleural pressures. The lung volume change corresponds to the change in the total lung volume during a complete breathing cycle. As shown in the figure, the Respiratory Model mimics the expected hysteresis of the P-V curve. Figure 12. 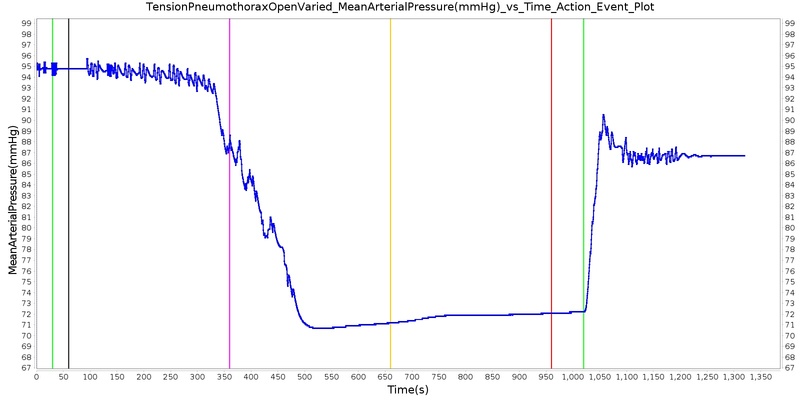 The pressure-volume curve for the standard patient of the Respiratory Model under normal physiological conditions. For comparison, the figure includes plot reproduced from literature  . The plot from the model shows the expected hysteresis of the P-V diagram observed in a healthy person. 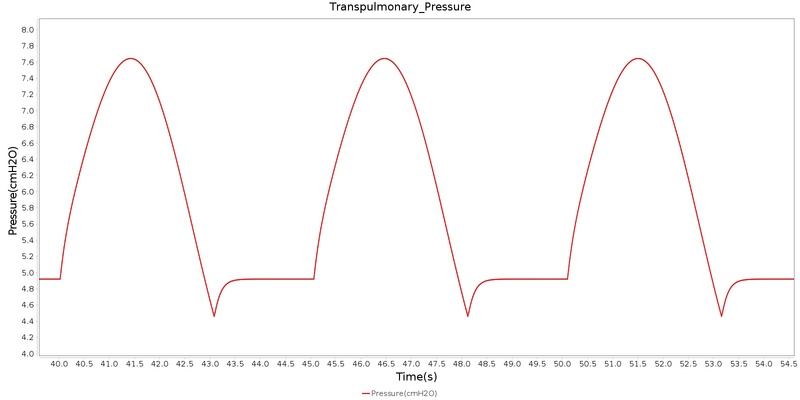 The Respiratory Model calculates the partial pressure of a gas at any node based on the total pressure and the volume fraction of the gas at the node. The node volume fraction of the gas and the node pressure are calculated in a manner described in the Substance Transport Methodology and Circuit Methodology, respectively. The Respiratory Model employs the above equation to predict the partial pressure of gases in the Respiratory System. The sections below present the results of alveolar and tracheal partial pressures of O2 and CO2. Figure 13 depicts the plot of PLungO2 for the left and right alveoli of the standard patient. Typically, the average alveolar partial pressure of oxygen is 104 mmHg  . The value from the engine is close to that of the literature. Figure 13. Alveolar O2 partial pressure. The partial pressure of O2 at the two alveoli nodes is calculated by using the pressure and the O2 volume fraction at each alveoli node. 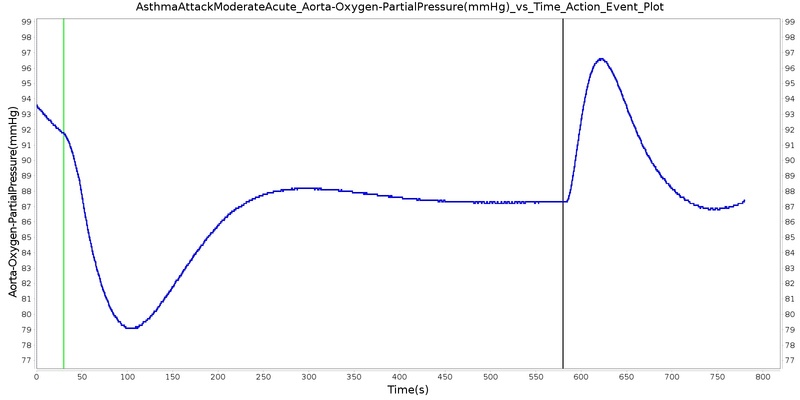 The plot shows the value of O2 partial pressure as a function of time over the course of multiple breathing cycles. 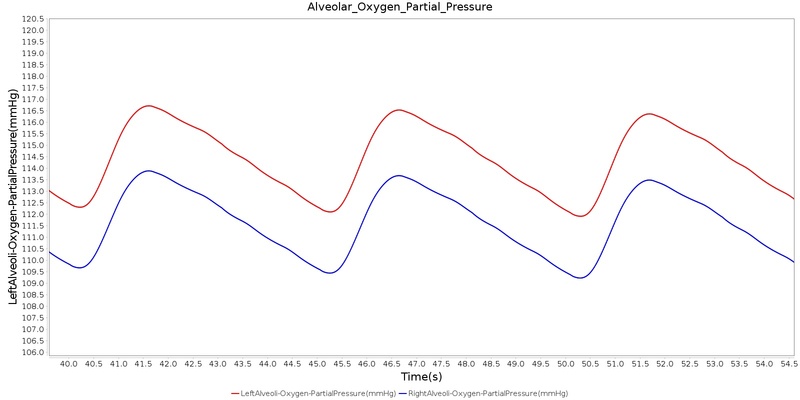 The alveolar CO2 partial pressure is calculated in the same manner as the oxygen partial pressure. Figure 14 depicts the plot of alveolar CO2 partial pressure for the left and right alveoli nodes. Typically, the average alveolar CO2 partial pressure is 40 mmHg  . The prediction from the engine is close to the expected literature value. Figure 14. Alveolar CO2 partial pressure. The partial pressure of CO2 at the two alveoli is calculated by using the pressure and the CO2 volume fraction at each alveoli node. 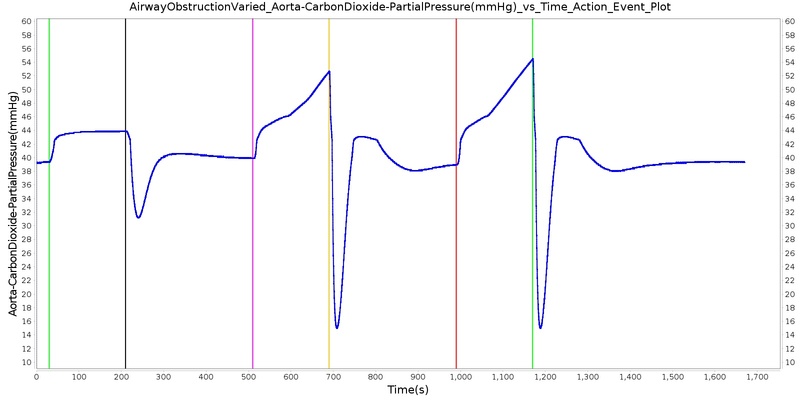 The plot shows the value of the CO2 partial pressure as a function of time over the course of multiple breathing cycles. Tracheal CO2 partial pressure is calculated in the same manner as the alveolar CO2 partial pressure. The engine calculates the tracheal partial pressure by using the pressure at the carina node. Recall that the carina node belongs to the node where the trachea branches into the mainstem bronchi. The figure below depicts the time variation of tracheal CO2 partial pressure. The waveform for CO2 partial pressure appears similar to those found in normal capnograph at the mouth (Fig.3.9, Ref  ). Figure 15. Tracheal CO2 partial pressure. The partial pressure of CO2 at the trachea is calculated by using the pressure and the CO2 volume fraction at the carina node. 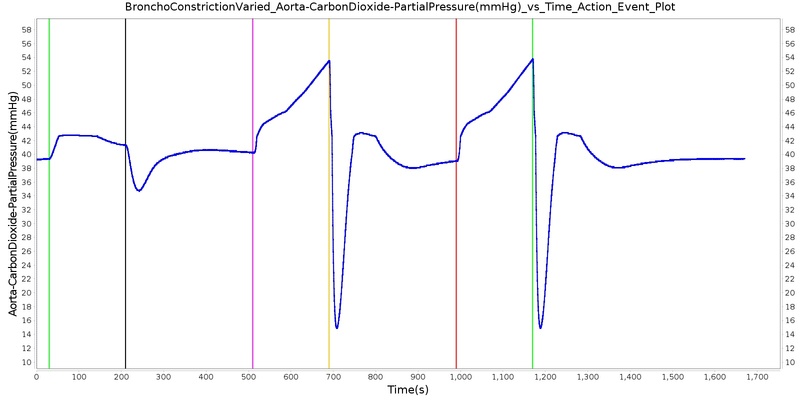 The plot shows the value of tracheal CO2 partial pressure over the course of one breathing cycle. The O2 partial pressure at the trachea is calculated in the same manner as the alveolar O2 partial pressure. 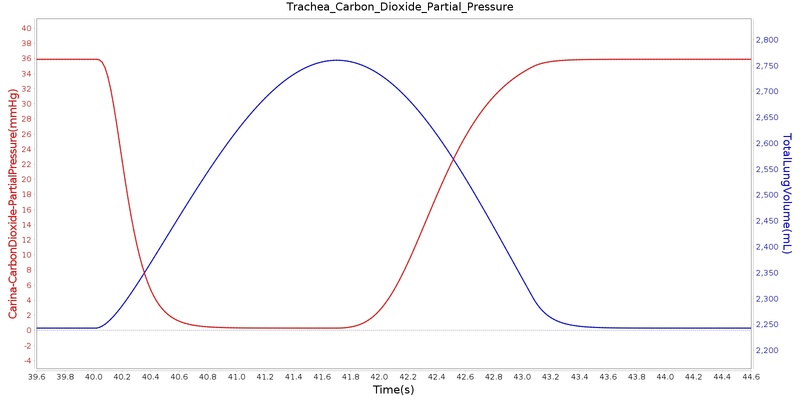 As mentioned for CO2 partial pressure, the model calculates the tracheal O2 partial pressure by making use of the pressure at the carina node. 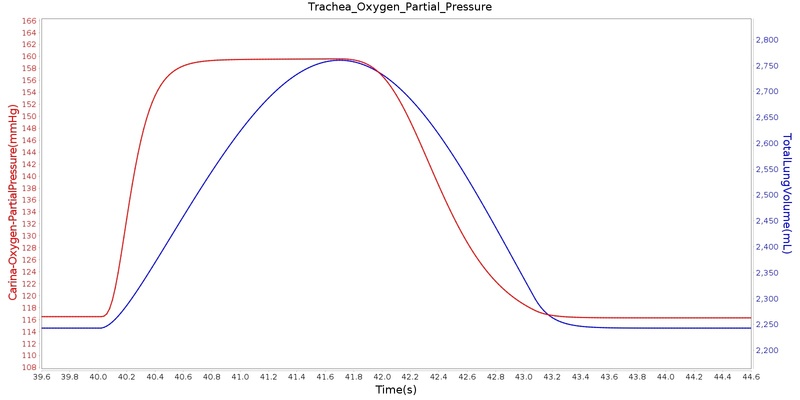 The output of the tracheal O2 partial pressure calculation is presented in Figure 16. Figure 16. Tracheal O2 partial pressure. The partial pressure of O2 at the trachea is calculated by using the pressure and the O2 volume fraction at the carina node. 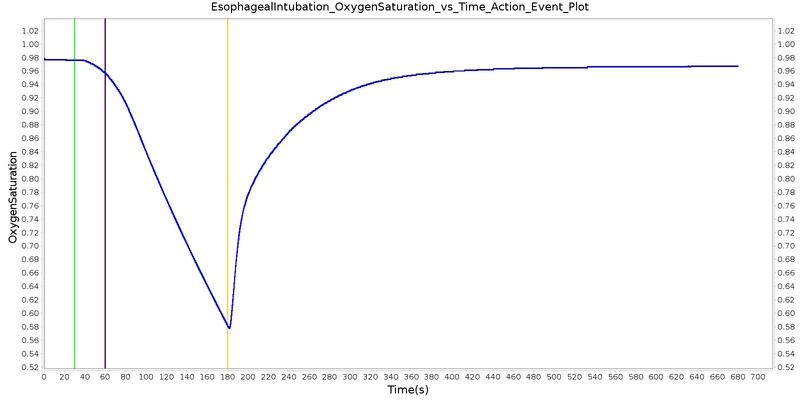 The plot shows the value of tracheal O2 partial pressure over the course of one breathing cycle. The Respiratory System interacts with other physiological systems either directly or indirectly through processes that involve the transport and exchange of gases. These interdependencies are discussed below. 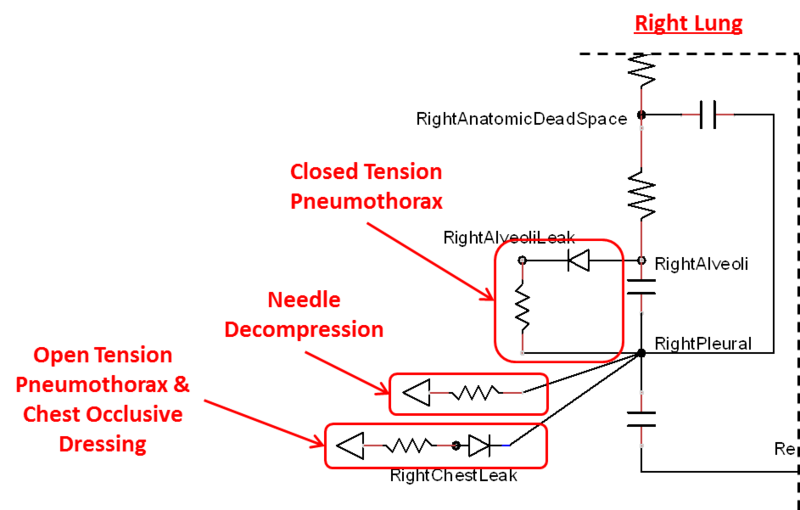 The transport of gases in the Respiratory Model is handled through the Transport functionality of the engine, where mass conservation based on volume fraction and volumetric flow rate of gases at the nodes and paths of the respiratory circuit is employed (see the Substance Transport Methodology for details). During free breathing, the ambient atmospheric volume fractions are used as an input to the Respiratory Model. By using methods described in the Substance Transport Methodology, the engine calculates the volume fraction of gases at the nodes associated with the respiratory functional units. The Respiratory System uses the calculated volume fractions and predicts various physiological parameters. For example, the gas volume fraction at the end of expiration, referred to as end-tidal gas concentration, can be monitored based on the results from the Substance Transport Methodology calculation. 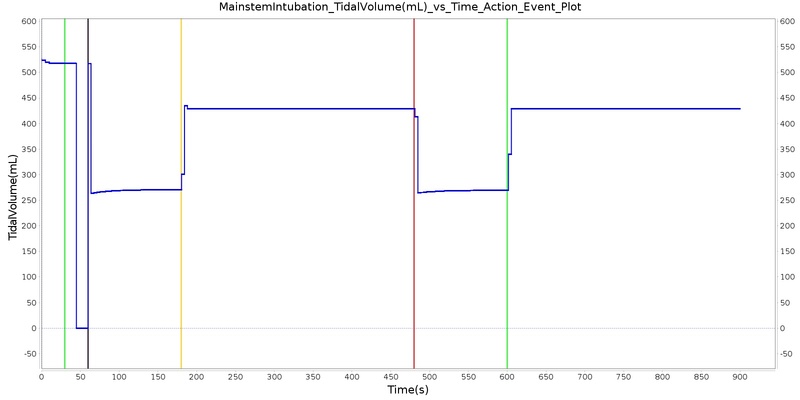 The end-tidal gas concentration is an important clinical parameter for monitoring patients and preventing mishaps related to insufficient ventilation or inappropriate gas concentration during anesthesia and immediate recovery . Monitoring end tidal CO2 (ETCO2) is a widely established clinical practice for verification of endotracheal tube placement and is also one of the standard requirements for monitoring patients in transport . The Respiratory Model provides the end-tidal gas concentration based on the expired gas volume fractions at the airway node. The Respiratory System interacts with the Environment System for the atmospheric pressure values assigned to the mouth node. Changes to the environmental conditions, such as changes in altitude, ambient temperature, humidity, and others, can affect the breathing pattern of the patient. The Respiratory System interacts with the Environment System to utilize the values of ambient pressures and gas concentrations that reflect the environmental condition. The Respiratory System also interacts with the Environment System for proper handling of inhaled gases that can arise from environmental incidents. At the alveoli-capillary interface, gas transfer occurs. The primary goal is to transfer incoming oxygen into the bloodstream for transport to other organs and to transfer waste carbon dioxide out of the body. This mechanism is also used to transport inhaled agents into the bloodstream from the Respiratory System. For more details on gas transport, see Substance Transport Methodology and Blood Chemistry Methodology. 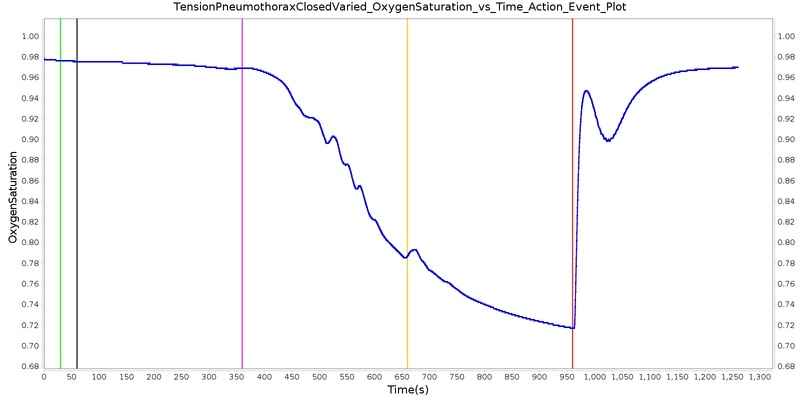 In the Respiratory Model, the spontaneous respiration rate is adjusted based on a chemical feedback mechanism that depends on the arterial oxygen and carbon dioxide levels as described above. The arterial oxygen and carbon dioxide levels depend on the level of O2 consumption and CO2 production in the circulatory system, which in turn affects the gas exchange at the alveolar-capillary interface. As the arterial O2 and CO2 levels change, the breathing rate, tidal volume, and alveolar ventilation also change, which in turn facilitates efficient gas exchange between the atmosphere and the body. This presents an example of how the engine integrates the circulatory and Respiratory Systems to regulate the blood gas levels. As drugs circulate through the system, they affect the Respiratory System. The drug effects on respiratory rate and tidal volume are calculated in the Drugs System. These effects are applied to the respiratory driver by modifying the frequency and amplitude of the breathing cycle. During the respiratory driver calculations, the respiratory rate and tidal volume changes that are calculated in the Drugs System are applied to the resulting respiratory rate and tidal volume calculated in the driver. Additionally, a neuromuscular block level is applied based on the drug effects. If the neuromuscular block level is above 0.15 on a scale of 0 to 1.0, then the respiratory rate and tidal volume are set to zero. This represents the paralytic effects of a neuromuscular block agent. The value of 0.15 was chosen to satisfy the block duration for succinylcholine and rocuronium. The strength of these effects, including the block effect, are calculated based on the plasma concentration and the drug parameters in the substance files in the Drugs System. For more information on this calculation see Drugs Methodology. A metabolic modifier is set by the Energy System (Energy Methodology) to drive the system to reasonable levels achievable during increased metabolic exertion. The modifier is tuned to achieve the correct respiratory response for near maximal exercise, and a linear relationship is assumed. This modifier is a direct multiplier to the target alveolar ventilation input into the system driver, and it causes an increase in both tidal volume and respiration rate. The Respiratory System can be hooked up to the anesthesia machine for positive-pressure ventilation (see the Anesthesia Machine Methodology). This is achieved by connecting the two fluid circuits. The anesthesia connection node is merely connected to the respiratory mouth node to allow for automatic calculation of the fluid mechanics by the circuit solver and transport by the substance transporter. The mechanistic cascading effects are automatically acheived, and everything else is modeled exactly the same as when the systems are disconnected. At each time iteration, the Circuit Solver calculates the values of the state variables for that particular time. Using the calculated state variables, the model predicts various physiological parameters of mechanical ventilation. 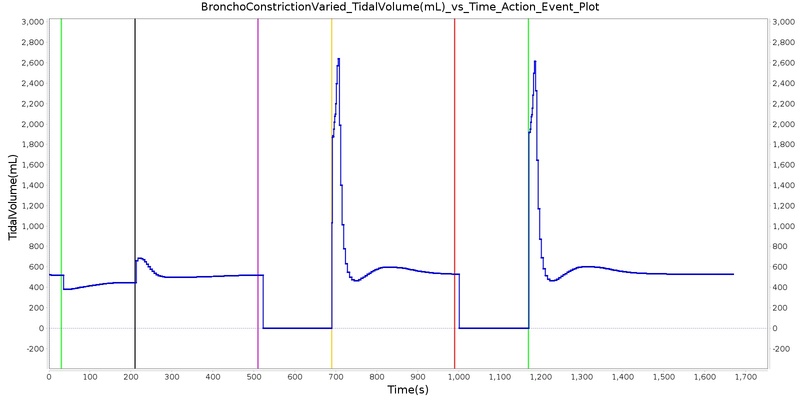 Many of the calculated system data outputs are derived from the difference between the minimum and maximum lung volumes and the time between occurances - e.g., tidal volume and respiration rate. Here Ppleu(min) and Ppleu(max) are the minimum and maximum respective pressures at the right and left pleural nodes. As in most lumped parameter models of mechanical ventilation, the Respiratory Model is based on two main parameters: the resistance R and the compliance C (or elastance E). Similar to their electrical analogues, these elements form a closed circuit to represent the energy dissipation and storage properties of the normal tidal ventilation. One extension of the linear model is the addition of inertance in the lumped parameter model. Inertance is not included in the model on the assumption that inertia does not play a significant role under conventional tidal breathing, as opposed to high-frequency ventilation. In the model, the Respiratory System is assumed to behave linearly in that the hydraulic resistance R is assumed to be independent of the flow rate Q, and the elastance E or the compliance C of the elastic component is assumed to be independent of the volume V. Therefore, under normal physiological conditions, the circuit elements (resistors and capacitors) of the Respiratory System are treated as constants. However, their values can be adjusted when addressing pathological conditions. The Respiratory Model does not distinguish between different functional units in the upper airway, the anatomical region where the inspired air is heated, humidified, and filtered. In this region, the flow of air is turbulent, as opposed to the laminar flow in lower airways. That means that the Ohm's analogue pressure-volume relation cannot be applied to this region. However, the model treats the upper airway as part of the mouth node and assumes laminar, incompressible flow for the remaining airway. The current version of the Respiratory Model does not account for the upper airways, and the detailed nature of upper airway flows will not be captured in the model. It is known that flows at the upper airways are turbulent, while flows in the lower respiratory tract are laminar. The absence of upper airways in the model can underestimate the airway flow. In this regard, the lumped parameter model is inherently at a disadvantage in handling complex geometries and flows that can represent detailed upper airway pathology. 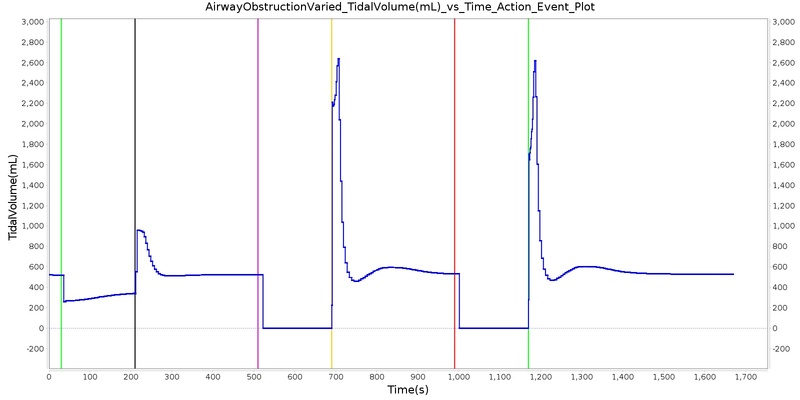 However, the model is sufficiently detailed to reproduce the respiratory responses associated with a number of airway pathologies at relatively low computational cost. Airway inertance is assumed to be negligible at normal respiratory frequencies. However, analysis of high-frequency ventilation (HFV) of up to 40 Hz ventilatory frequency would require the inclusion of inertance  . In mechanical ventilation, HFV is a useful procedure that permits significantly decreased pressure amplitude and tidal volume, preventing trauma in artificial ventilation. When compared to conventional mechanical ventilation, HFV is considered to be the preferred method of mechanical ventilation in patients with acute lung injury  . The small tidal volumes needed in HFV are thought to offer an advantage over conventional ventilation in limiting additional lung injury from mechanical ventilation  . The current version of the Respiratory Model handles conventional mechanical ventilation but not HFV. The model makes no distinction between different generations of bifurcating airways. Therefore, factors affecting the regional ventilation and perfusion of the lungs cannot be captured by the model. Chronic Obstructive Pulmonary Disease (COPD) is an obstructive lung disease characterized by chronically reduced airflow into the lungs. Symptoms typically include increased respiration rate, decreased tidal volume, decreased expiratory flow, and reduced oxygen saturation  . Unlike asthma, the reduction in airflow does not generally improve with medication. Symptoms typically worsen over time, often leading to death. COPD is caused by damage to the small airways in the lungs and destruction of the alveolar membranes. When tissue damage occurs primarily in the airways, the condition is called chronic bronchitis. When tissue destruction is focused in the alveoli, the condition is called emphysema. In the engine, COPD is a manifestation of both conditions, although one condition may dominate. The engine simulates COPD by modeling damage to the small airways and alveolar membranes. COPD severity is controlled by two severity values, a chronic bronchitis severity value and an emphysema severity value. Chronic bronchitis severity is used to scale the airflow resistance through the lower airways in the circuit model, simulating airway tissue damage and scarring. Increasing chronic bronchitis severity increases the airflow resistance through the lower airways. The function used to determine airflow resistance for COPD is the same as that used for asthma (see Figure 18) and is based on chronic bronchitis severity. Emphysema severity is used to scale destruction of the alveolar membranes. Destruction of the alveolar membranes decreases the effective surface area for gas exchange, thereby reducing alveolar gas transfer. In cases of severe emphysema, up to 80% of the alveolar membranes are destroyed, with a corresponding reduction in effective gas diffusion surface area . The engine scales the gas diffusion surface area using a multiplier based on emphysema severity. The function used to determine the gas diffusion surface area multiplier is plotted in Figure 17. Additionally, The engine models destruction of lung tissue with an increase in alveolar compliance. The function used to determine the compliance multiplier is plotted in Figure 18. The destruction of the alveolar membranes also destroys the pulmonary capillaries embedded in the membranes. 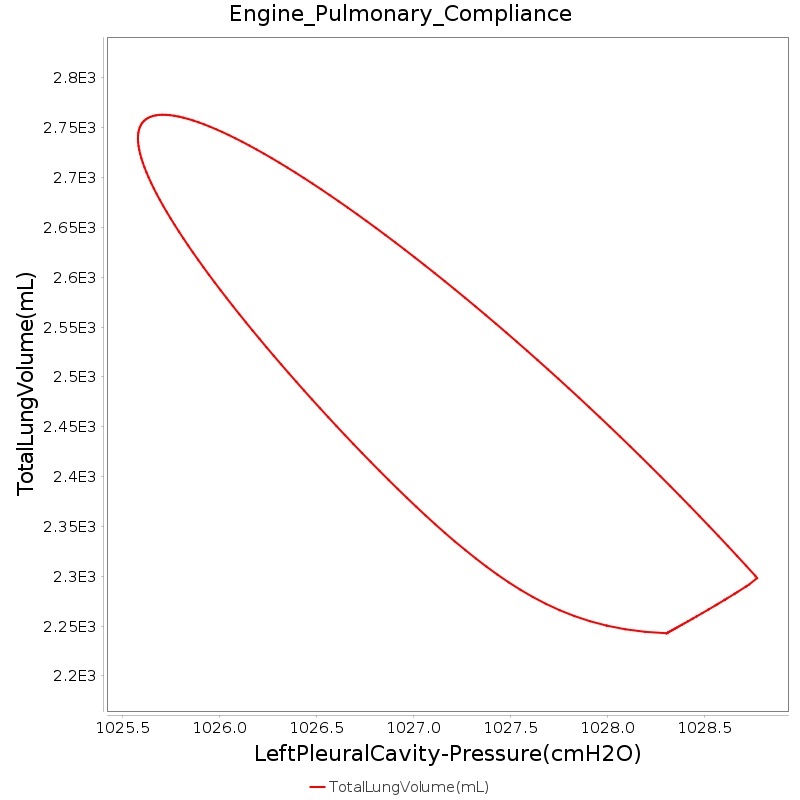 To model pulmonary capillary destruction, the engine increases the pulmonary capillary flow resistance based on severity. Although increased pulmonary capillary resistance is related to alveolar membrane destruction, and therefore associated with emphysema, the engine uses either emphysema severity or chronic bronchitis severity (whichever is higher) to determine the pulmonary capillary resistance multiplier - see Figure 19. This was done in an attempt to model increased blood pressure and elevated heart rate, which are symptoms of both emphysema and chronic bronchitis. Increasing the capillary resistance should increase arterial blood pressure as the heart pumps harder to overcome the increased resistance in the lungs. However, we were unable to successfully model either increased blood pressure or elevated heart rate for COPD, as the validation results show (see Results and Conclusions). This will be the focus of later efforts to improve the model. Decreased Inspiration-Expiration (IE) ratio is another pathophysiologic feature of COPD. As with asthma, the normal IE ratio is scaled using a multiplier based on severity. Either chronic bronchitis severity or emphysema severity (whichever is higher) is used to determine the IE ratio scaling multiplier - see Figure 20. Figure 17. Gas diffusion surface area multiplier as a function of emphysema severity. Gas diffusion surface area decreases with increasing emphysema severity. Figure 18. Alveoli compliance multiplier as a function of emphysema severity. Alveoli compliance increases with increasing emphysema severity. Figure 19. Pulmonary capillary flow resistance multiplier as a function of COPD severity. Pulmonary capillary flow resistance increases with increasing chronic bronchitis or emphysema severity, whichever is higher. Figure 20. IE ratio multiplier as a function of COPD severity. IE ratio decreases with increasing chronic bronchitis or emphysema severity, whichever is higher. Lobar pneumonia is a form of pneumonia that affects one or more lobes of the lungs. Symptoms typically include increased respiration rate, decreased tidal volume, reduced oxygen saturation, decreased IE ratio, and increased body temperature  . As fluid fills portions of the lung, it becomes more difficult to breathe. Fluid also reduces the effective gas diffusion surface area in the alveoli, reducing alveolar transfer of oxygen and carbon dioxide into and out of the bloodstream  . The engine simulates lobar pneumonia by decreasing the alveoli compliance in the respiratory circuit, which models increased breathing difficulty due to fluid congestion in the alveoli. Similarly, gas diffusion surface area is reduced using the same function as for COPD (see Figure 17). Decreased IE ratio is pathophysiologic feature of lobar pneumonia. Like COPD, the normal IE ratio is scaled using a multiplier based on severity. The engine uses the same function as for COPD to determine the IE ratio multiplier (see Figure 20). Figure 21. Alveoli compliance multiplier as a function of lobar pneumonia severity. Alveoli compliance decreases with increasing severity. The impaired alveolar exchange generically models an unspecified reduction of effective alveolar surface area. This condition causes less effective gas exchange between the Respiratory and Cardiovascular systems. The user can specify either a fraction or area value of the surface area to remove. Airway obstruction refers to a blockage in the airway that partially or wholly prevents airflow into or out of the lungs. Airway obstructions can occure at the lower and upper airways. They can be caused by foreign objects, allergic reactions, infections, inflammations, toxic gases, and other reasons. The pathological symptoms and physiological manifestations of airway obstructions are as diverse as the causes, and the severities of the obstructions follow suit. Dyspnea (breathing difficulty) is the obvious common symptom of airway obstruction. The complications of breathing difficulty include hypoxia (low oxygen levels) and hypercapnia (high carbon dioxide levels), respiratory acidosis, and others. The current version of the Respiratory Model attempts to reproduce the physiological responses arising from foreign body upper airway obstruction. Foreign body airway obstruction is fairly common during anesthesia. One example is the case reported by  where the oxygen saturation (SPO2) of a patient dropped to 40 percent due to a blockage by a parasitic nematode during the use of a laryngeal mask airway. The Respiratory Model simulates airway obstruction by increasing the flow resistance across the path connecting the airway node to the carina node. This path corresponds to the flow through the trachea. 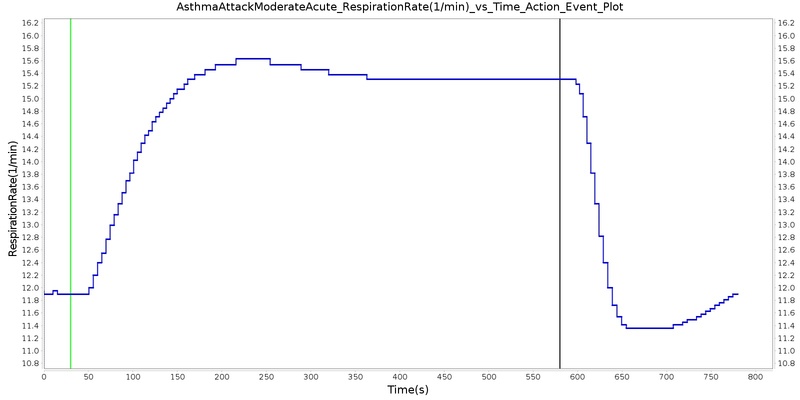 The model then calculates the physiological responses due to increased airway resistance. Figure 22. Logarithmically increasing resistance values used to increase the airway resistance in relation to the airway obstruction severity levels. A patient with bronchospasm experiences a sudden constriction of the muscles in the walls of the bronchioles, decreasing the airway diameter. Such decrease in the bronchial airway diameter, or bronchoconstriction, results in the reduction of gas flow into or out of the lungs and causes difficulty in both spontaneous and mechanical ventilation. A number of factors can trigger bronchospasms, including a foreign body in the airway and stimulation of an endotracheal tube in patients with reactive disease  . The Respiratory Model accounts for this respiratory distress by adjusting the resistance of the bronchi units. The increase in bronchial airway resistance results in a decrease in gas flow in and out of the alveoli, which in turn affects the gas concentration in the circulatory system. The engine then responds to the respiratory distress in proportion to the level of bronchoconstriction. The Intubation action sets the type of intubation present: off, tracheal, esophageal, right mainstem, or left mainstem. Tracheal intubation is the successful state. See Anesthesia Machine Methodology for more details about intubation and mechanical ventilation. During endotracheal intubation, a flexible tube is inserted orally or nasally down into the trachea to facilitate ventilation of the lungs during mechanical ventilation. A potential complication of endotracheal intubation is mainstem intubation, an incident where the tube is inadvertently placed too deep into one of the two mainstem bronchi. In such incidents, the unintubated lung does not contribute to gas exchange, and a right-to-left shunt can occur, resulting in hypoxia  . Furthermore, the intubated lung can be hyperinflated, predisposing to overdistension and barotrauma  . Right mainstem intubation is the common complication of endotracheal intubation because of the shallower angle that the right mainstem bronchus makes with the trachea, though the engine includes the ability to simulate left mainstem intubation as well. The Respiratory Model attempts to simulate this incidence by manipulating the resistance representing the opposite bronchus functional unit of the Respiratory System. A numerically large resistance is selected for this circuit element for complete blockage of flow into the lung. The model then evaluates the physiological responses arising from the incidence. Another complication of endotracheal intubation is esophageal intubation, an incident where the endotracheal tube is inadvertently placed in the esophagus. When such an incidence occurs, the lung does not receive air. The Respiratory System models esophageal intubation by opening the airflow path leading to the esophagus and closing the flow path leading to the trachea compartment. This is accomplished in the model by assigning a numerically large value for the tracheal resistance and assigning a small resistance to the esophageal compartment. The lack of airflow into the lungs affects the amount of alveolar-capillary gas exchange, which in turn affects the hemodynamic and respiratory responses of the engine. Pneumothorax is an abnormal accumulation of air in the pleural cavity, i.e., a thin space between the visceral and parietal pleura separating lungs from the chest wall, due to factors that cause air to escape into the pleural space. The accumulation of air in the pleural space limits the space available for full lung inflation and increases the intrathoracic pressure, causing a collapse in the ipsilateral lung depending on the type and severity of the incidence. Pneumothoraces are classified as traumatic and nontraumatic or spontaneous based on their cause. Pneuomothoraces are classified as open (sucking chest wound) or closed (intact thoracic cage) pnumothoraces  . The Respiratory Model is capable of simulating traumatic tension pneumothorax. Tension pneumothorax is a life-threatening condition that occurs when air escapes into the pleural space on inspiration, but cannot return on expiration due to a one-way valve effect of the injury. This causes a progressive build-up of air within the pleural space. The Respiratory System implements a model for tension pneumothorax by including subordinate circuit elements that represent the flow and trapping of air in the pleural space. The circuit elements represent both the open and closed pneumothorax condition. In the open tension pneumothorax condition, air is allowed to enter from the atmosphere into the pleural space as in penetrating chest wound traumas. In the closed tension pneumothorax case, the model allows air to escape from the lung into the plural space as in laceration of the lung following blunt trauma. 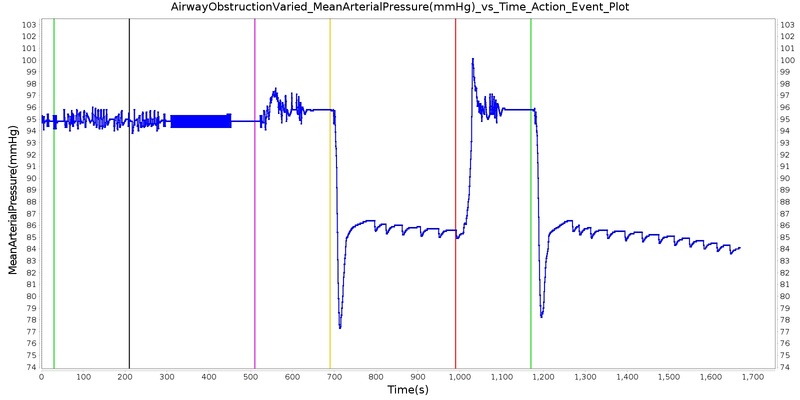 The model evaluates the physiological responses arising from increased intrapleural pressure and leakage in the airflow of the respiratory circuit. Figure 23. Both lungs in the engine have elements to mimic the effects of open and closed tension pneumothorax insults as well as chest occlusive dressing (for open) and needle decompression (for both) interventions. The red boxes denote these additional elements. Figure 24. 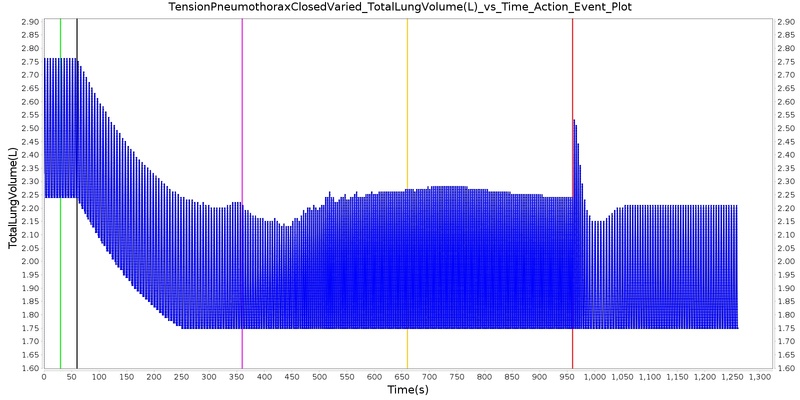 An exponential function is used to map pnemothorax action severity to leak resistance. This same function is used for both the open and the closed tension pneumothorax. Asthma is a common inflammatory disease of the airways (bronchi and bronchioles) where air flow into the lungs is partially obstructed. Acute asthma is an exacerbation of asthma that does not respond to standard treatments. Symptoms include elevated respiration rate, labored breathing, and a reduction in oxygen saturation, among others. It is generally considered a life-threatening obstruction of the airway requiring immediate medical attention. During an acute asthma attack, airflow is partially obstructed during exhalation, and flow resistance is 5 to 15 times normal  . The engine simulates this by increasing the airway flow resistance in the circuit model. The function used to determine the airway flow resistance multiplier is shown in the figure below. The asthma attack severity is governed by a specified severity value. The higher the severity, the more severe the asthma attack, and the higher the resistance values are set. 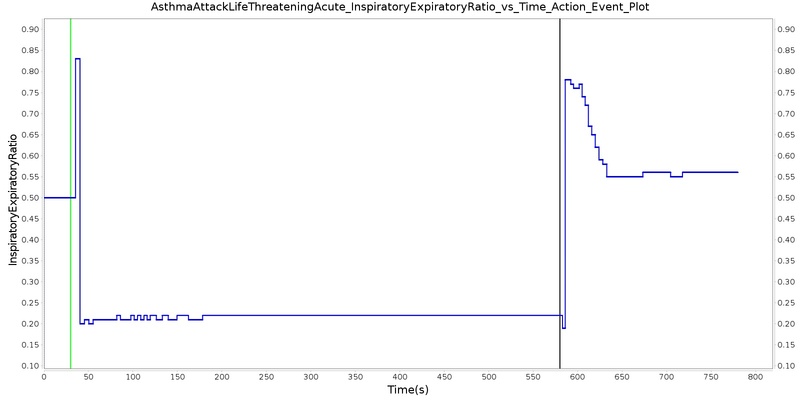 Additionally, the inspiratory/expiratory (IE) ratio decreases during an acute asthma attack. It takes a noticeably longer time to exhale than inhale  . In the engine, the normal IE ratio is scaled using a multiplier based on severity to model decreased IE ratio during an acute asthma attack. Figure 25. 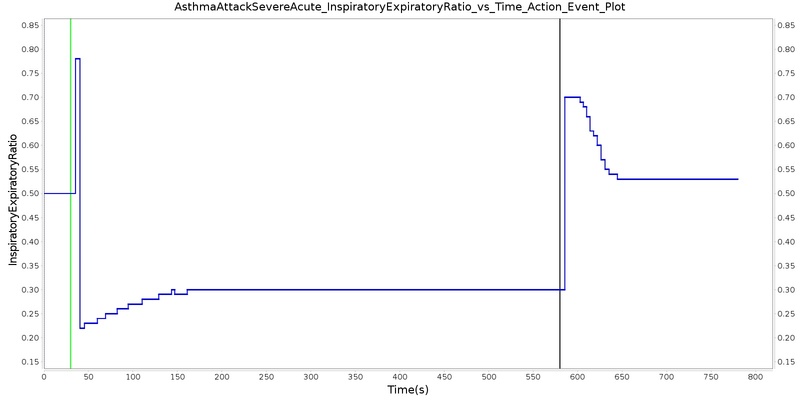 Airway flow resistance multiplier as a function of asthma severity. Airway flow resistance increases (during exhalation) with increasing asthma severity. Figure 26. IE ratio multiplier as a function of asthma severity. IE ratio decreases with increasing asthma severity. The management of an open tension pneumothorax requires sealing the open chest wound with an occlusive dressing. Such intervention slows the progression of tension pneumothorax and may ensure recovery if timely intervention takes place. The Respiratory Model simulates occlusive dressing by assigning large flow resistance across the element that serves as an electrical analogue open switch for the path linking the pleural cavity to the environment. Based on this implementation, the model calculates the physiological responses arising from numerical equivalent occlusive dressing. Tension pneumothorax is a life-threatening condition that requires immediate intervention to relieve the air trapped in the pleural space and reduce the intrapleural pressure to the subatmospheric level. Needle decompression is a procedure that allows air to escape from the pleural space into the environment. This procedure relieves the accumulated air, allowing full expansion of the affected lung. The Respiratory Model is capable of simulating needle decompression by incorporating a circuit element that permits airflow based on pressure differential between the pleural space and the environment. The model then evaluates physiological responses to the intervention. Forced Exhale: The "depth" or "shallowness" of the exhalation is determined by the expiratory reserve volume fraction, which specifies what portion of the expiratory reserve volume to exhale. If set to 1.0, the patient exhales his or her entire expiratory reserve volume, leaving only the residual volume in the lungs. The time period over which to execute the exhale is determined by the period. Forced Inhale: The "depth" or "shallowness" of the inhalation is determined by the inspiratory capacity fraction, which specifies what portion of the inspiratory capacity to inhale. If set to 1.0, the patient inhales his or her entire inspiratory capacity, completely filling the lungs. The time period over which to execute the inhale is determined by the period. Breath Hold: The time period to hold breath is determined by the period. Use Inhaler: The Inhaler command is interpreted by the inhaler equipment (Inhaler Methodology). Conscious respiration has any number of potential applications and is likely to be implemented to attain proper breathing while using an inhaler, generate a spirometry curve, or simulate coughing. 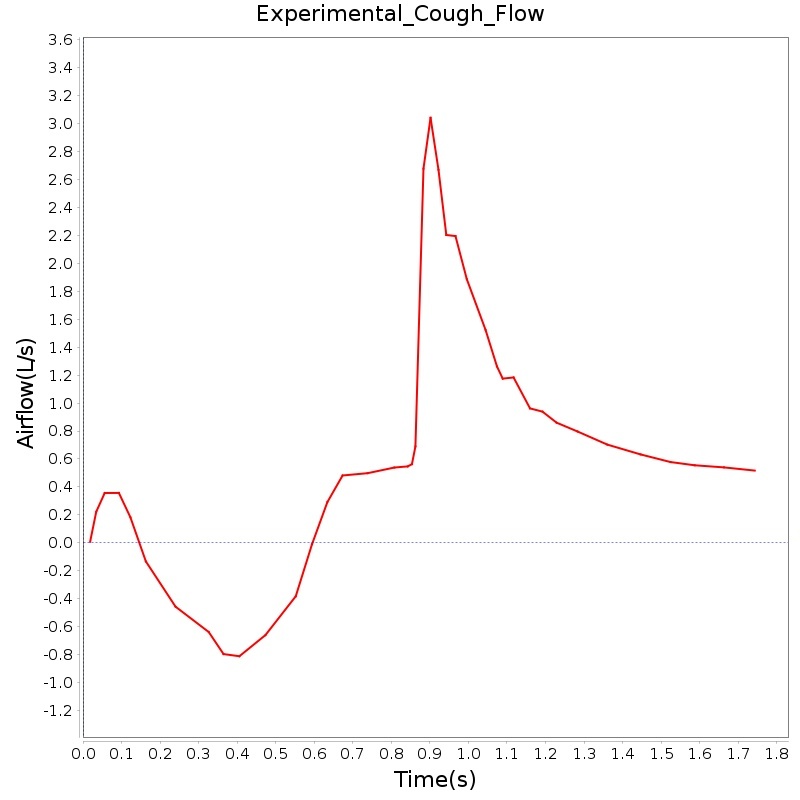 Figure 27 shows the results for a cough scenario that leverages the conscious respiration action compared to empirical data. Figure 27. 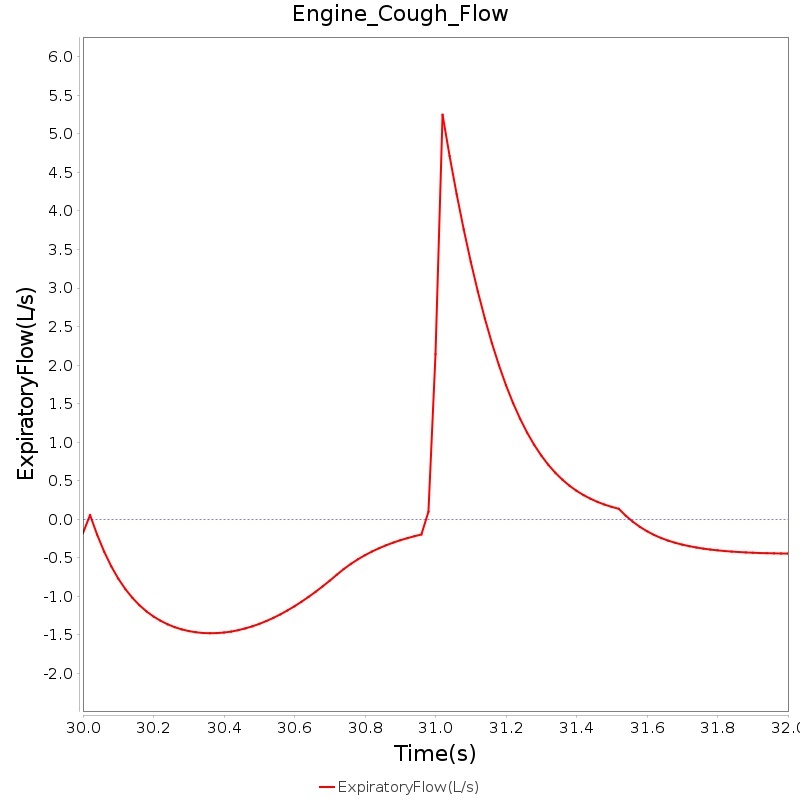 The airflow curve of a simulated cough in engine generated from a conscious respiration with quick forced inhale and exhale in series. For comparison, the figure includes a plot reproduced from literature determined by a voluntary cough immediately following office-based vocal fold medialization injections . Mechanical ventilation allows the user to specify an instantaneous pressure and/or flow value at the respiratory connection point (i.e., mouth). The substance volume fractions at the connection can also be specified. If no volume fractions are given, the ambient values set in the Environment system will be used by default (see Environment Methodology). All settings will remain constant during the simulation, unless removed or modified. This action is likely to be most beneficial implemented in combination with real-world sensors. Manikin or task trainer values can be fed into the the engine to synchronize in real-time. The Respiratory system triggers Maximum Pulmonary Ventilation Rate event to alert the user when the patient pulmonary ventilation exceeds maximum value. Bradypnea is defined as an abnormally low breathing rate. Normal breathing rates for healthy adults are relatively standard, but can vary based upon condition. Low breathing rates can decrease total ventilation if not compensated for, which can lead to hypercapnia or hypoxia. In the engine, bradypnea occurs when the respiratory rate falls below 10 breaths per minute  and returns to normal when it rises back above 10.5 breaths per minute. Tachypnea is defined as high breathing rate. Normal respiration rate in an adult ranges 12 - 20 breaths per minute. Tachypnea occurs when breathing rate rises above 20 breaths per minute. The engine outputs a tachypnea event when the patient's respiration rate is above 20 breaths per minute. Respiratory acidosis is triggered when the blood pH drops below 7.37. An irreversible state (similar to a death state) is reached when the blood pH drops below 6.5. See Energy Methodology for more details about acidosis. Respiratory alkalosis is triggered when the blood pH rises above 7.45. An irreversible state (similar to a death state) is reached when the blood pH rises above 8.5. See Energy Methodology for more details about alkalosis. There are three levels of Acute Respiratory Distress (ARD) - mild, moderate, and severe. These levels are based on Carrico Index thresholds that provide insight into the effectiveness of the alveolar transfer of oxygen. The pulmonary function test allows the user to request a collection of respiratory data at a specified time step. This data is then used to produce a waveform representing normal inspiration and expiration. The waveform period is dictated by the respiration rate at the time of the pulmonary function test. The waveform magnitude is calculated from the tidal volume at the specified time and the functional residual capacity. The waveform is calculated for an artificial time of 60 seconds. This time is neither engine time nor real time, but instead is an assumed time, and the complete 60 second duration is calculated at the current engine time step. This does not indicate the duration of an actual pulmonary function test, but it does allow visualization of many breathing cycles. Within two periods of the 60 second duration, the waveform magnitude is modified to produce the inspiratory and expiratory reserve volume. The inspiratory and expiratory reserve volumes are presented as a forced inspiration and expiration. 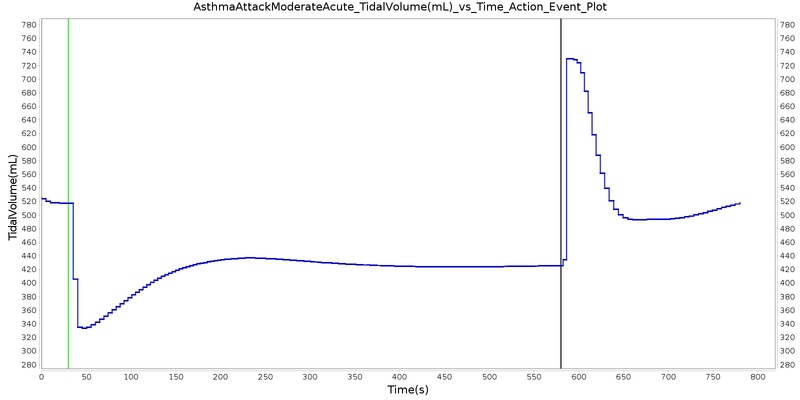 To model this effect, the period of the breathing cycle is dilated during the magnitude increase. 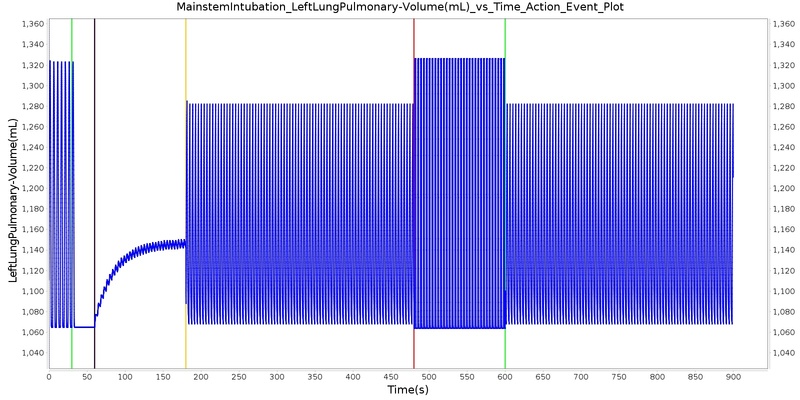 At the conclusion of the imposed 60 second duration, a lung volume plot is produced (see the figure in Validation - Assessments) that displays the generated lung volume waveform. The Respiratory System was validated quantitatively and qualitatively under resting physiological conditions and transient (action-induced) conditions. The validation is specified with a color coding system, with green indicating good agreement with trends/values, yellow indicating moderate agreement with trends/values, and red indicating poor agreement with trends/values. The Respiratory Model outputs a number of system-level and compartment-level resting physiologic parameters. The tables below compare the values of system- and compartment-level parameters obtained from the model with referenced values. The outputs from the model correspond to the system- and compartment-level respiratory related values of the standard patient (77kg adult male) under resting physiologic conditions. As shown in Table 3, the majority of the physiological variables show a good match with the literature. The outputs for the major respiratory variables, such as respiration rate, tidal volume, and pulmonary ventilation specifically match well with the reference data. Table 3. Validation of the resting physiologic state of the Respiratory System. The table shows comparison of system-level outputs from the engine to referenced values. System-level outputs show favorable agreement with validation data. The deviations in end tidal carbon dioxide fraction and transpulmonary pressure can be attributed to the tuned parameters used in the model that are selected to meet the major system level physiological parameters. Table 4. Validation table for the resting physiologic states. The table shows comparison of compartment-level outputs from the engine to referenced values. The majority of the variables show good match with the validation data. There are significant deviations in the carina flow and the dead space volumes. Future versions will address these issues. The actions and interventions associated with the Respiratory System were validated quantitatively where possible and qualitatively elsewhere by comparing the engine output to expected trends and values. For each scenario, the table shows the total number of results in each category. For many investigated scenarios, the model shows good agreement with the expected trends. For the scenarios that did not match with the expected trends, improvements are planned for future engine releases. Table 5. 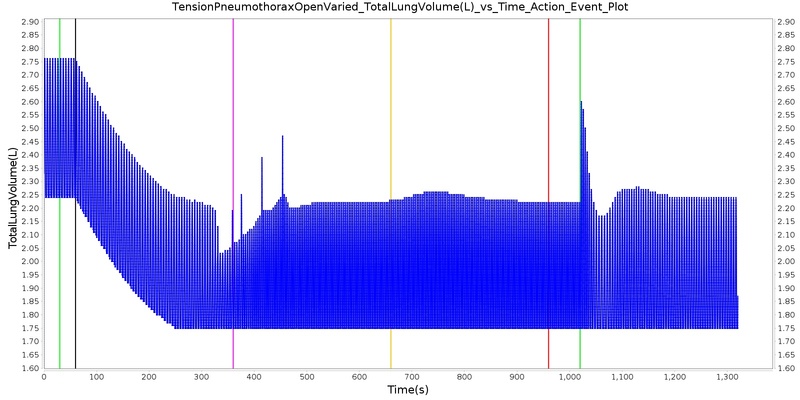 Cumulative validation results for Respiratory specific conditions and actions scenarios. The COPD condition was validated against two scenarios. The severe emphysema scenario (Emphysema Severity = 0.7, Bronchitis Severity = 0.5) attempts to model Gold Stage III Emphysema. Here, most metrics show moderate to good agreement with trends, but a few poor results were obtained. We plan to investigate these issues in later versions. Table 6. Validation matrix for severe emphysema. This condition corresponds to GOLD Stage III COPD   . The table shows the engine output compared to validation data for respiratory and hemodynamic values. Table 7. Validation matrix for severe chronic bronchitis. The table shows the engine output compared to validation data for respiratory and hemodynamic values. The lobar pneumonia condition was validated against three scenarios; severe pneumonia in the one lobe of the left lung (Severity = 0.7), severe pneumonia in two lobes of the right lung (Severity = 0.7), and moderate pneumonia in both lungs (Severity = 0.2). The engine does not model the discrete lobes of each lung, so infected-lobe behavior is modeled by applying pneumonia severity against a fraction of each lung. The fraction approximates the portion of the lung (by volume) that the lobe(s) occupy. In the case of the left lung, there are two lobes. Each lobe constitutes approximately 50% of the whole lung. It is understood that the actual volume distribution is not equal for the two lobes, but we use this as an approximation. The same is true for the right lung, which has three lobes. In all three scenarios, expected general trends are observed for most measures. However, heart rate and blood pressure do not follow expected trends. This is similar to COPD, where heart rate and blood pressure also do not always behave as expected. Additionally, increasing core body temperature is also a symptom of lobar pneumonia that fails to agree with the validation data. However, we expected this disagreement since the engine doesn't currently model elevated body temperature in response to infection. This is something we plan to address in subsequent releases. Table 8. Validation matrix for severe lobar pneumonia concentrated in one lobe in the left lung. The table shows the engine output compared to validation data for respiratory and hemodynamic values. Table 9. Validation matrix for severe lobar pneumonia concentrated in two lobes in the right lung. The table shows the engine output compared to validation data for respiratory and hemodynamic values. Table 10. Validation matrix for moderate lobar pneumonia in both lungs. The table shows the engine output compared to validation data for respiratory and hemodynamic values. The airway obstruction action was validated with a scenario that applies an airway obstruction action with varying severities, 0.3, 0.6, and 1.0. Varying the severity of the obstruction simulates partial obstructions and a complete obstruction. The severity levels logarithmically increase the airway resistance, as shown in Figure 22. The resulting outputs from the engine are shown in Table 11 for common clinical parameters, such as heart rate, respiratory rate, and oxygen saturation. In the event of complete airway obstruction, a drop in oxygen saturation and respiration rate are expected. In contrast, hemodynamic variables, such as heart rate, are expected to increase. Figure 28. Select outputs from the airway obstruction scenario. Table 11. 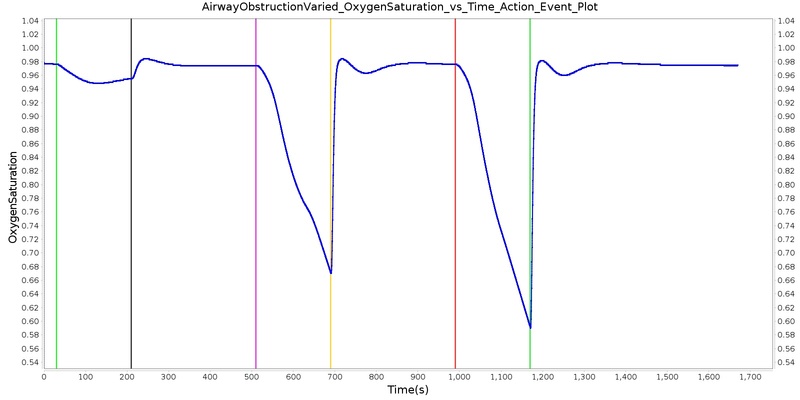 Validation matrix for physiological responses due to varying severities of airway obstruction. The bronchoconstriction action was validated with a scenario that applies a series of bronchoconstrictions with varying severities, 0.3, 0.6, and 1.0 to the patient. Varying the severity of the obstruction simulates the constriction of the bronchii, leading to obstructed air flow. The severity levels logarithmically increase the airway resistance, as shown in Figure 22. Figure 29. Select outputs from the bronchoconstriction scenario. Table 12. Validation matrix for physiological responses due to varying severities of bronchoconstriction. Three scenarios were used to validate tension pneuomthorax and its associated interventions, occlusive dressing, and needle decompression. Table 13 demonstrates the open tension pneumothorax on the left side of the chest at increasing severities treated with an occlusive dressing and needle decompression. The engine output for relevant parameters was compared to the validation data. The blood pressures (systolic, diastolic, and mean arterial pressure) do not show hypotension during the open wound pneumothorax incidence. Other respiratory and cardiovascular outputs show good agreement with published data. Vital signs become more dire the longer the pneumothorax is applied without intervention and as the severity (i.e. hole size) is increased. Evidence suggests that patients have progressive respiratory deterioration with final respiratory arrest . However, the current model does not include a definition for respiratory arrest and will continue to run until another irreversible state is reached. After an occlusive dressing is added to seal the hole and needle decompression is applied, the patient's condition improves and vitals begin returning toward normal. This is as expected compared to the validation data. It is important to note nervous system responses of a conscious patient due to pain or panicking are not included with the Pneumothorax action. Some of these responses can be attained by including an Acute Stress action (see Endocrine Methodology). Figure 30. Select outputs from the open tension pneumothorax scenario. Table 13. Validation matrix for physiological responses due to varying severities of open tension pneumothorax, as well as occlusive dressing and needle decompression interventions. Figure 31. Select outputs from the closed tension pneumothorax scenario. Table 14. Validation matrix for physiological responses due to varying severities of closed tension pneumothorax, as well as needle decompression interventions. Figure 32. Select outputs from the bilateral tension pnemothorax scenario. Table 15. Validation matrix for physiological responses due to open tension pneumothorax on one side in combination with closed tension pneumothorax on the other side, as well as occlusive dressing for the open side and needle decompression interventions for both sides. The right and left mainstem intubation actions were validated with a scenario that simulates mechanical ventilation with improper tracheal tube placement. In this scenario, the patient is injected with succinycholine, then mechanically ventilated through the placement of the endotracheal tube. During the intubation action, the tube is incorrectly placed, leading to the right and left mainstem intubation. The mainstem intubations are then set to the trachea for proper function. Common clinical vital signs were compared to validation data, as shown in Table 16. Figure 33. Select outputs from the right mainstem intubation scenario. Table 16. Validation matrix for physiological responses due to varying severities of right mainstem intubation and correction. The esophageal intubation action was validated with a scenario with multiple intubation attempts, a failed esophageal intubation following by a successful endotracheal intubation. In this scenario, the patient is injected with succinycholine, followed by mechanical ventilation via an endotracheal tube. The first attempt at intubation results in an esophageal intubation. A second attempt is successful. All clinical outputs validated agreed with expected trends. 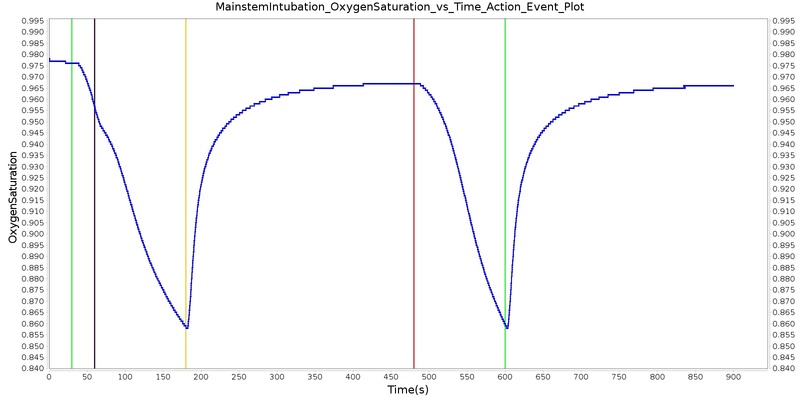 As previously mentioned, oxygen saturation shows a decrease as expected within the sampled time. A longer run time for the scenario would show a sharper decrease in the oxygen saturation. Figure 34. 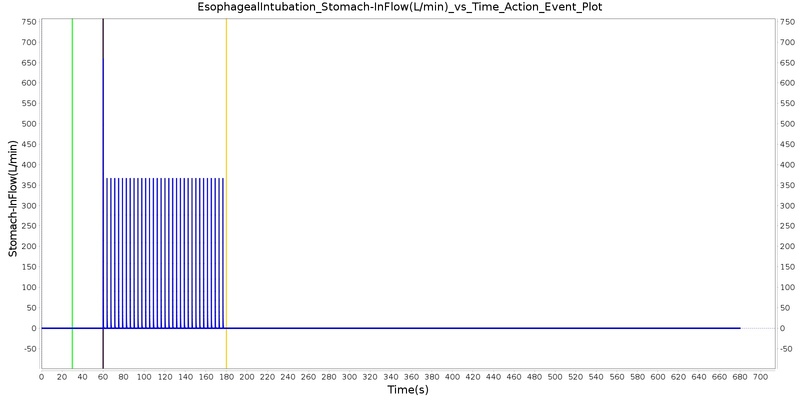 Select outputs from the esophageal intubation scenario. Table 17. 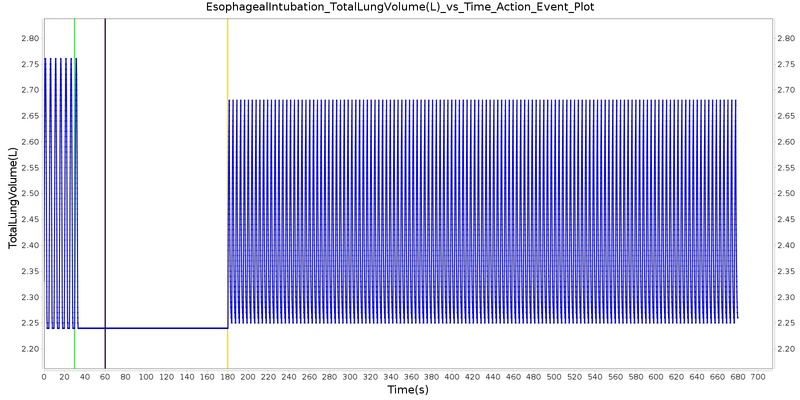 Validation matrix for physiological responses due esophageal intubation and correction. The acute asthma action was validated against three scenarios: moderate (severity = 0.3), severe (severity = 0.7), and life-threatening (severity = 0.9). In all three cases, general trends for respiration rate, trachea flow, tidal volume, and IE ratio fall in line with expected behavior. CO2 partial pressure and O2 saturation also tend to agree with expected values. However, blood pressure and heart rateare less consistent. Figure 35. Select outputs from the moderate airway obstruction scenario. Table 18. Validation matrix for physiological responses due to moderate acute asthma and correction. Figure 36. 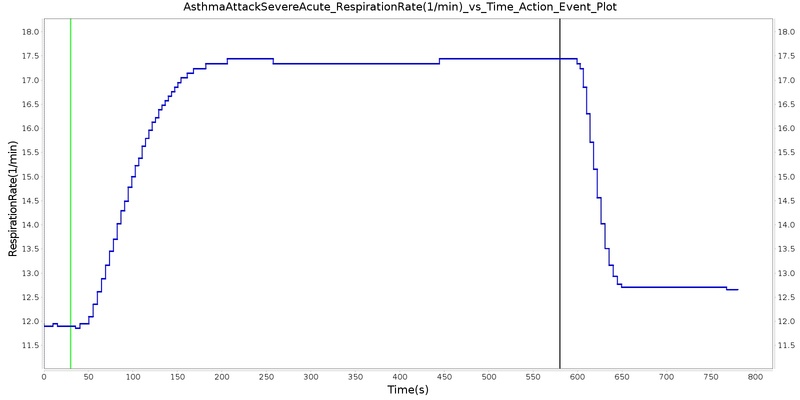 Select outputs from the severe asthma attack scenario. Table 19. Validation matrix for physiological responses due to severe acute asthma and correction. Figure 37. 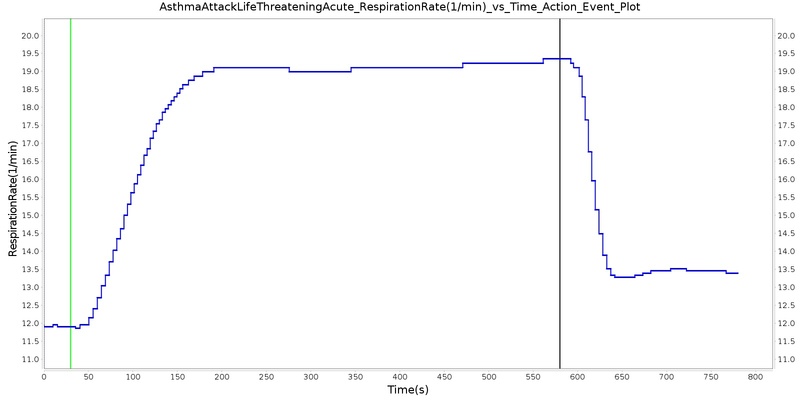 Select outputs from the life threatening asthma attack scenario. Table 20. Validation matrix for physiological responses due to life threatening acute asthma and correction. Apnea directly effects the achieved respiratory driver (breathing muscles) pressure amplitude. The more severe the apnea, the lower the tidal volume. Conscious respiration is validated as part of inhaler usage described in the Inhaler methodology section Inhaler Methodology. Validation of the pulmonary function test may be concluded from the validation of the resting physiologic quantities. The collection of values produced from the pulmonary function test were validated above. Additional validation comes by comparing the general shape of the produced waveform to an expected waveform. 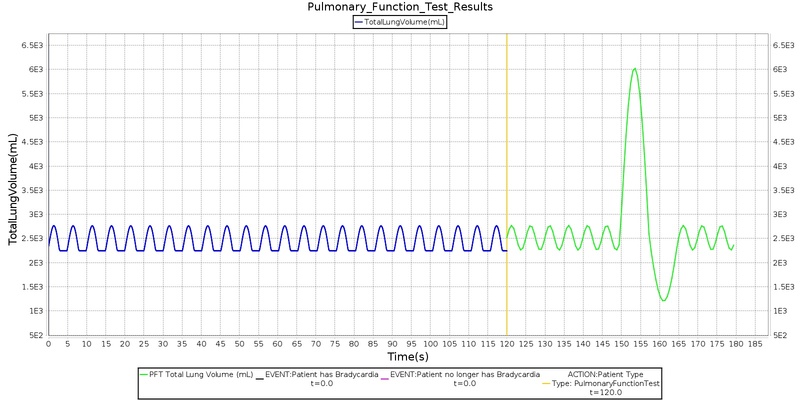 The plot shown in Figure 38 presents a way of representing the engine pulmonary function test visually. There is excellent agreement with the plot produced from the engine and the plot found in the literature . Figure 38. 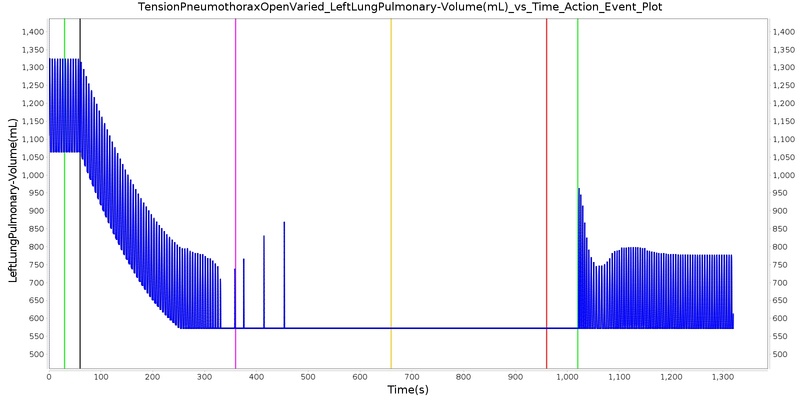 The lung volume plot from the pulmonary function test displays the lung volume waveform. The waveform has a frequency associated with the respiration rate of the patient at the time of the pulmonary function test. The inspiratory and expiratory reserve volumes are shown with a dilated period to represent a forced component of the inspiration and expiration. 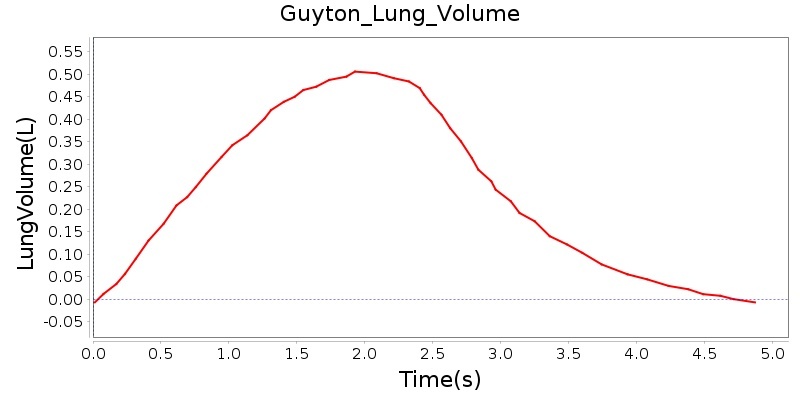 The lung volume plot shown is presented with 100 data points. 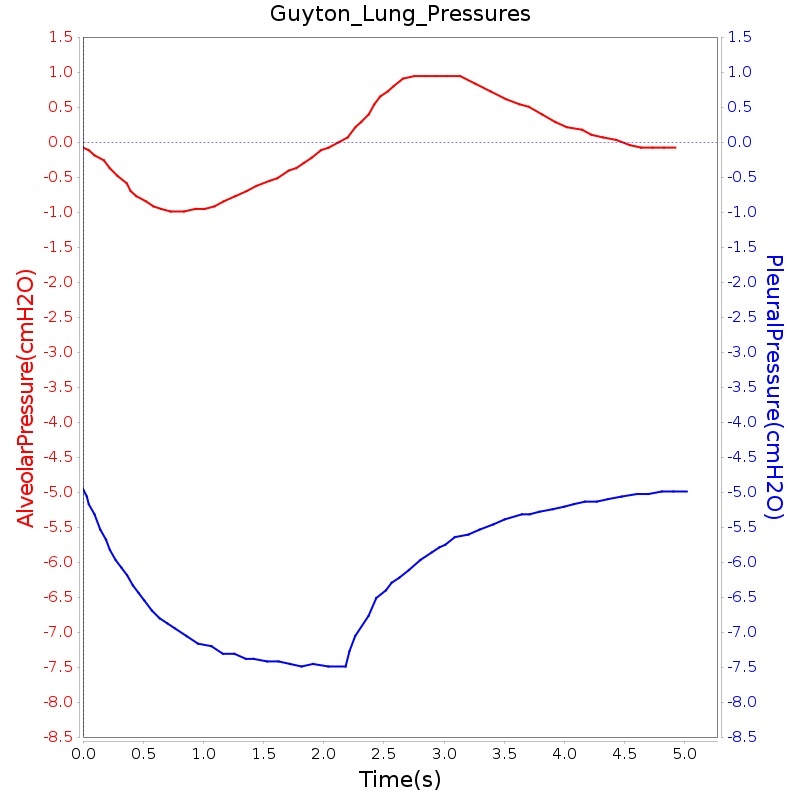 Mathematical modeling of the pulmonary physiology dates back to the work of Gray (1945) and others, including Guyton and collaborators  . Since then several mathematical models have been developed that describe aspects of the pulmonary physiology in considerable detail. However, the scope and complexity of the human physiology demands a model that integrates the dynamic respiratory physiology with other systems such as cardiovascular, renal, and others. As a result, there is a need for an integrative modeling environment that serves as a tool for predicting aspects of the human physiology and pathology. The Respiratory Model provides a system-level computational model that allows for real-time simulation of normal pulmonary physiology and respiratory distresses. The model employs a circuit-based lumped parameter mathematical model that allows for the characterization of patient-specific respiratory mechanics at a relatively low computational burden. The coupling of the Respiratory System with the Circulatory System through gas exchange and respiratory distress modifiers permits robust prediction of respiratory effects on hemodynamic variables. Accordingly, the current version of the Respiratory System is capable of predicting respiratory and hemodynamic responses to various insults like airway obstruction, bronchoconstriction, pneumothorax, and others. As part of a modeling tool for various clinical settings, the Respiratory Model can be hooked up to the anesthesia machine for mechanical ventilation. During positive pressure ventilation, the Respiratory Model permits the transport of inhaled volatile gases and others from the anesthesia machine to the circulatory system. Such an integrative approach allows for the examination of respiratory and cardiovascular responses to various stimuli and stresses as observed in practical application. The Respiratory System, along with the other systems in the engine, can serve as a training tool for exploring the dynamic interaction between physiological systems. Researchers can benefit from the integration of higher-fidelity modules into the existing model for more detailed and project-specific analysis. In its current form, the Respiratory Model is adapted to a specific patient using physiological parameters selected from patient data. This limits the practical application of the model to the tested standard model. However, the common data model platform gives the user the ease and flexibility to select parameters to experiment their own patient setting. The development of an integrative model like the Respiratory System provides opportunities for exploring various pulmonary diseases and distresses. One common pulmonary distress that can be modeled by the Respiratory Model corresponds to the Acute Respiratory Distress Syndrome (ARDS). This condition compromises alveolar gas transfer and leads to low levels of oxygen in the blood. Future funding may be sought for incorporating and validating ARDS model in the Respiratory System. A respiratory control mechanism for rhythmic breathing could be added to the engine. Rhythmic breathing is achieved by the respiratory neurons in the medullary respiratory center that give rise to activity in the efferent nerves ennervating the respiratory muscles. The neural control network that relates the respiratory neuron output to the mechanical airflow is not incorporated in the current version of the Respiratory Model. The current version of the Respiratory Model has succeeded in controlling the breathing cycle through parameters that adjust the spontaneous breathing based on a chemical control feedback mechanism. While this development allows robust chemical stimuli responses, incorporation of the neural circuitry model that controls the ventilation process can provide a more accurate implementation of the Respiratory System that includes behavioral control of breathing.